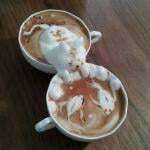 @amadazulsim Happy Monday to you too! Hope you're having a great day too--I am, it feels great to be excited to play again! Can't wait for your update! Fall has fallen into my game! 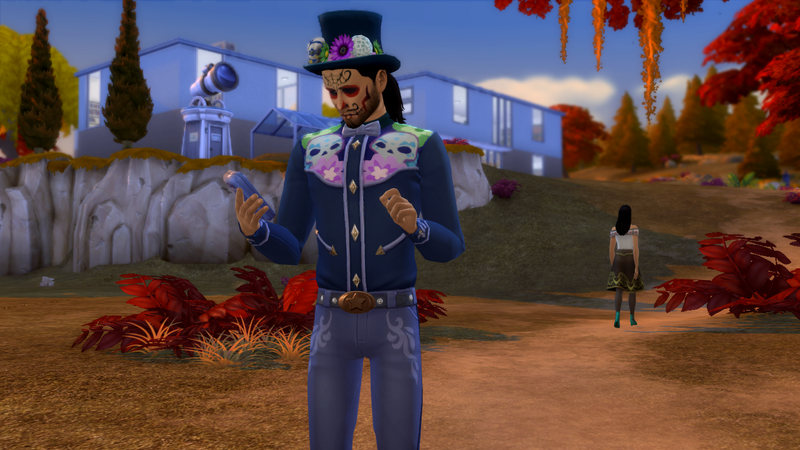 ...a lot of townies are celebrating the Day of the Dead! 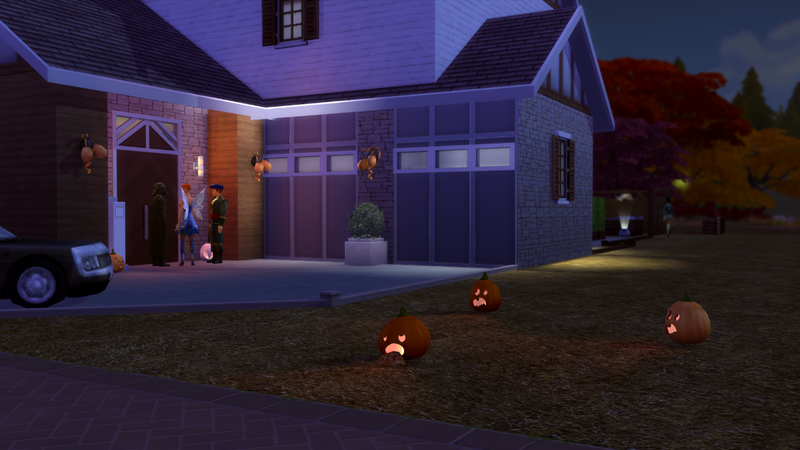 I like that EA didn't just repeat last year's trick-or-treating; plus, I love the timed challenges they patch in. I'm determined to actually finish this one, lol! The kids are back to school! They've only got a few days left, so I'm trying to make the most of it. Noah is level 6 or 7 in the handiness skill. 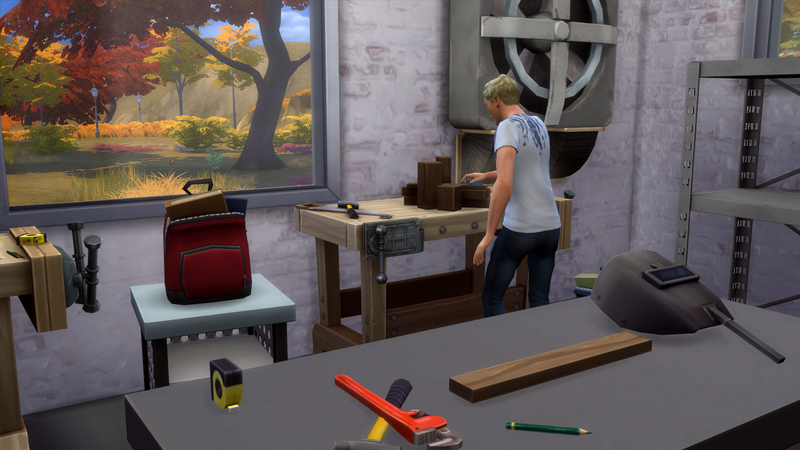 He's been crafting all kinds of homemade furniture for his future home. Owen is level 9 in the programming skill. He's currently developing a new app to try to get a head start in the tech industry (he wants to be a start-up entrepreneur when he grows up). Also, much to my disappointment, he and Janette are still just friends. Of course, their lives can't be all sunshine and sugar skulls--that would be boring! Derek's team decided he's getting too old to keep up, so they let him go. Poor guy! 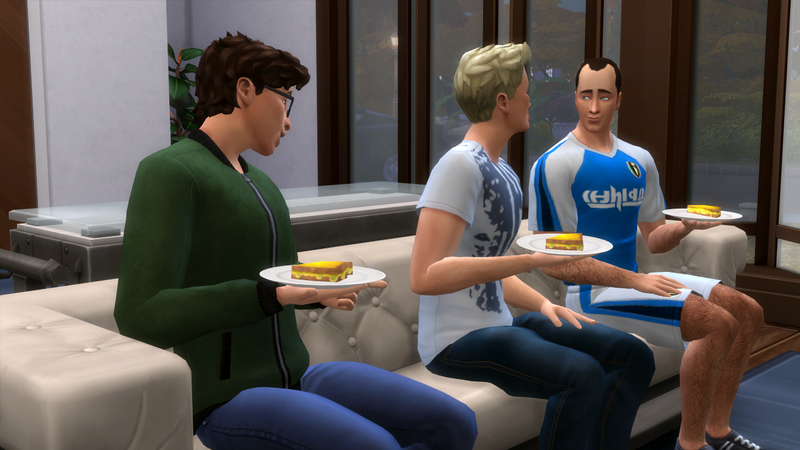 The boys managed to cheer him up--grilled cheese makes everything better! Besides, they'll be graduating soon and getting jobs of their own, so they aren't too worried about money. Owen, Noah, and Violet met up to spend their last Sunday as teenagers at the boardwalk. They headed down to Cafe Frenzy, an internet cafe. 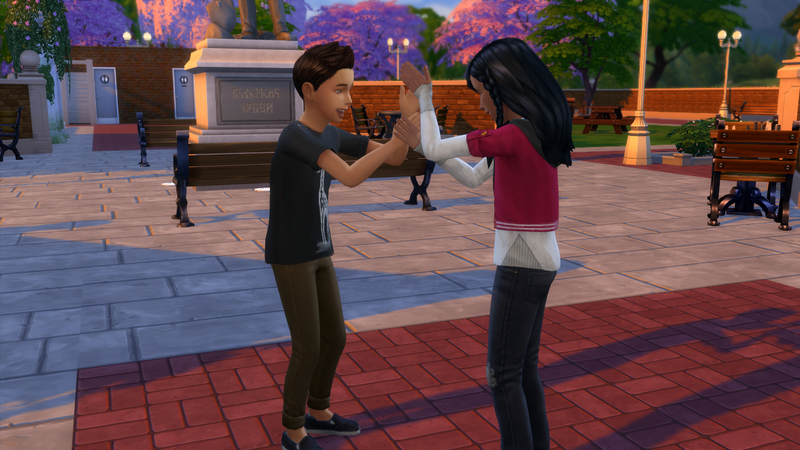 Noah and Vi flirted up a storm over coffee & breakfast. 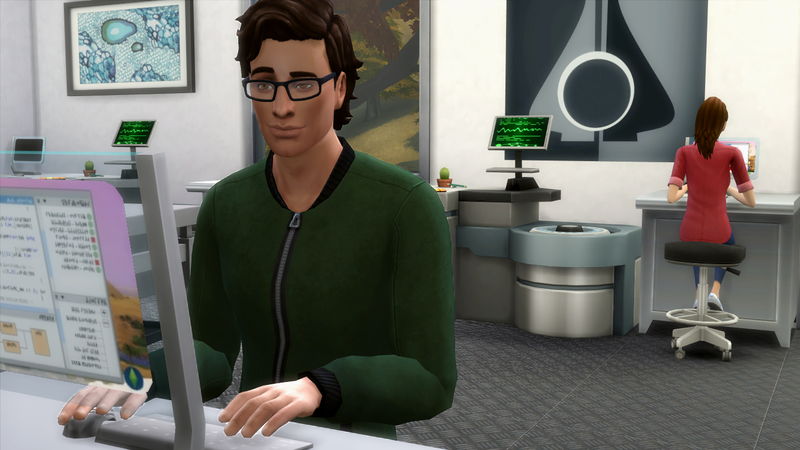 Owen continued developing his app; he's even more determined to finish it now that he'll more than likely be the breadwinner of the family. After working so hard all day, Owen was treated to a family movie night with Canadian bacon pizza! 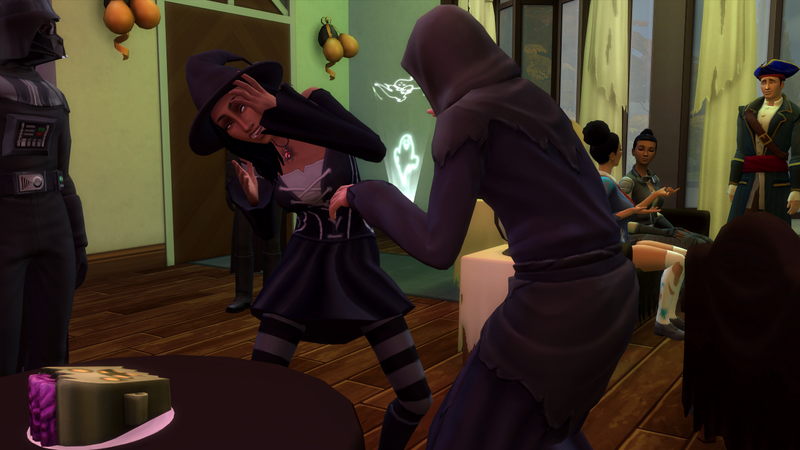 The last days of school flew by... Time for their spooky-themed graduation party!! And a spooky time it was! In case you couldn't tell, Owen was the ninja and Noah was the grim reaper (they chose their own costumes lol). The redheaded fairy is cousin Elliana (Amos' daughter). 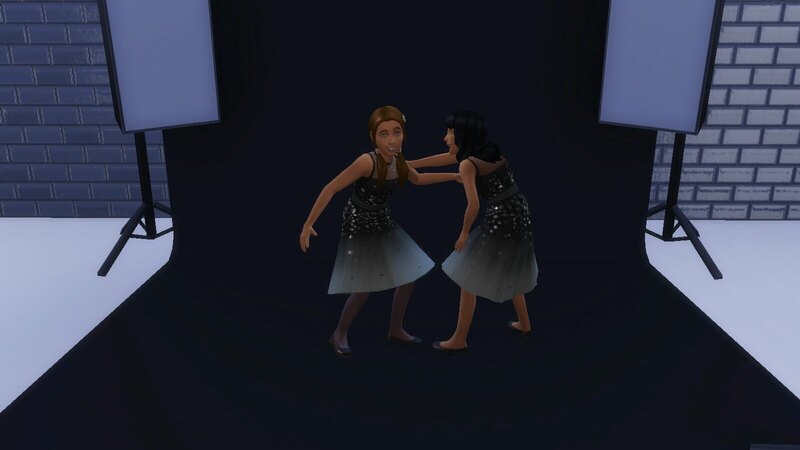 Also, the interstellar smuggler is Violet's mom, and the zombie schoolgirl is Violet's best friend Ciara. My babies are all grown up now..
JK...kinda. I'm having major heir regret and considering adding Rose in so Owen can be my heir... What do I do??? As always, I love your town shot. I'm very curious about what the unfinished lot is! I'm so sad about Audrey...I really love her and I feel like her life just sped by! I still can't believe Gary is gone. Daniel really is a cutie though. Charlotte is so pretty too. I don't think I realized before how pretty she is. @JordanNicoleJJ wow look how pretty everything is! I love fall too. We're right at peak in New England and I'm loving it. 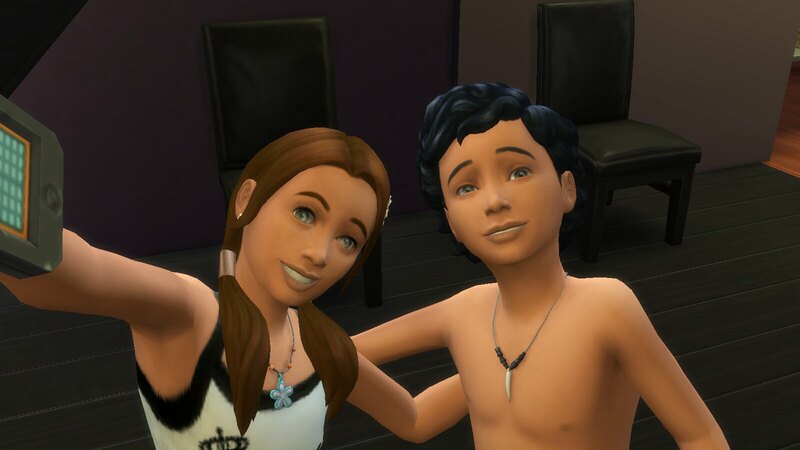 I love seeing your kids hanging out together and while I do love Noah and Violet, I really love Owen...and I had mate regret with Rose...I really wanted Gavin to fall for her but he had his heart set on Hana...so I wouldn't cry if you changed heirs! 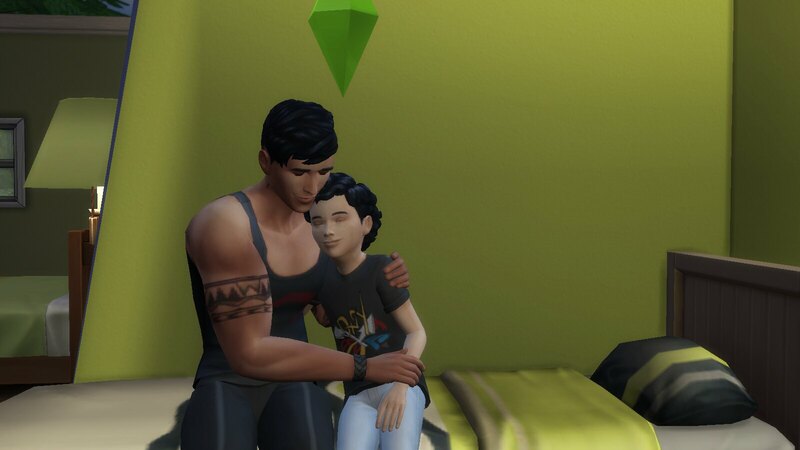 Even though Logan gets home late at night he makes time for the kids. He missed dinner tonight, but he spent a couple of hours reading to the kids. They think it’s a hoot when their dad uses his funny voices. And, even though he’s exhausted, when Kenzie wakes up in the middle of the night craving taco casserole, he joins her. 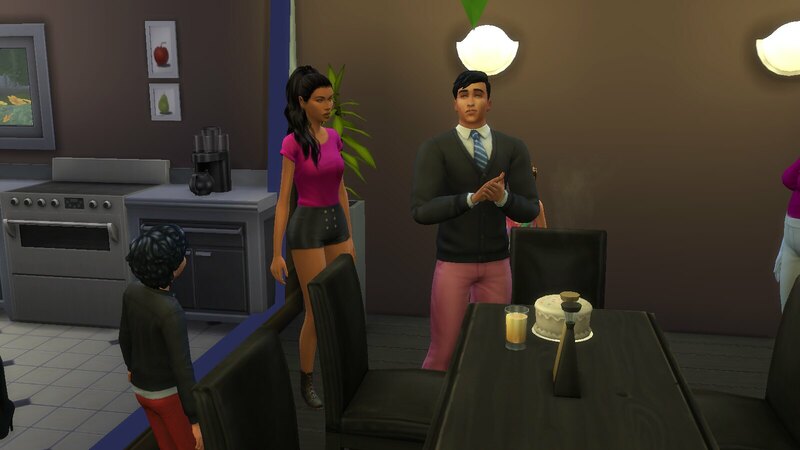 The next night they went out to the club to celebrate Saul’s birthday. He is feeling pretty alright with himself. It turned out to be a bit much for Kenzie though. She went into labor soon after. “Be nice to Mama!” Logan said to his little ones. Once they got to the hospital Logan decided to panic and Kenzie was embarrassed. Even in the delivery room he was a wreck. Yet their little boys still managed to make it into the world. Joshua. 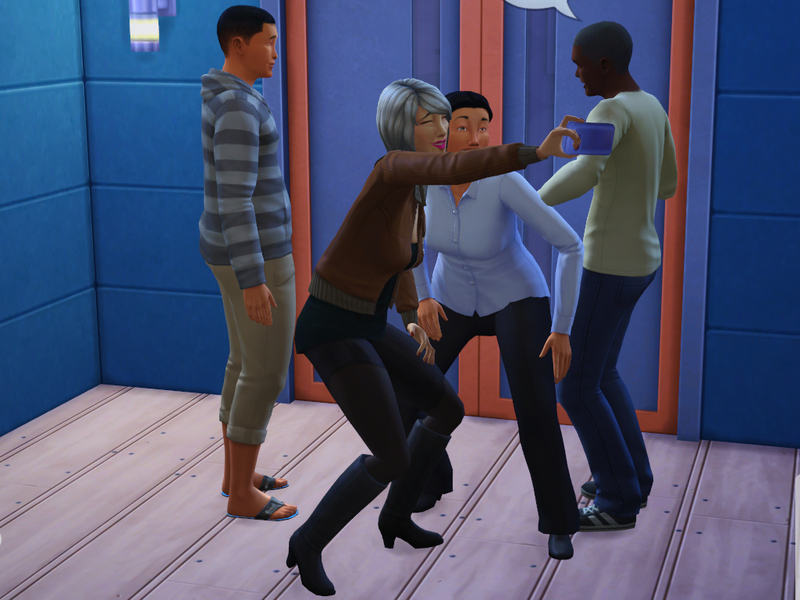 When they got home…I don’t know what’s wrong with this woman! @OJenn Thank you. I appreciate the guidance. I have a bit before I need to worry about that then. @debjameswhite Congrats on the twin boys they are very handsom! @Meeshelby - When I lose interest I usually take a break for a few days. 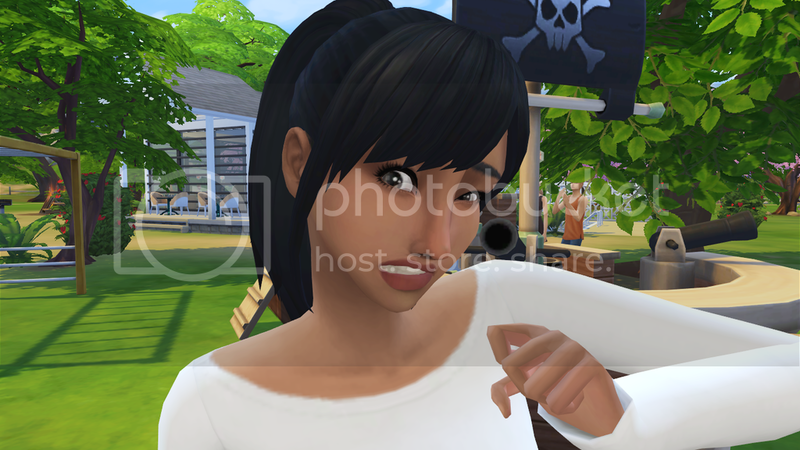 Then If my motivation to play isn't back I'll read through old updates, and download new CC until it comes back. It just hasn't been working for me lately. You said Elisabeth and Richard's kids have shocked you? In a good way? Now I can't wait for your next update! Oh and the skin I use is HERE. I don't mind elaborating about why I'm unhappy with the game's direction, but It's gonna be long so I'll put it under a spoiler lol. To sum it up, TS4 is just a huge step backwards for The Sims franchise. 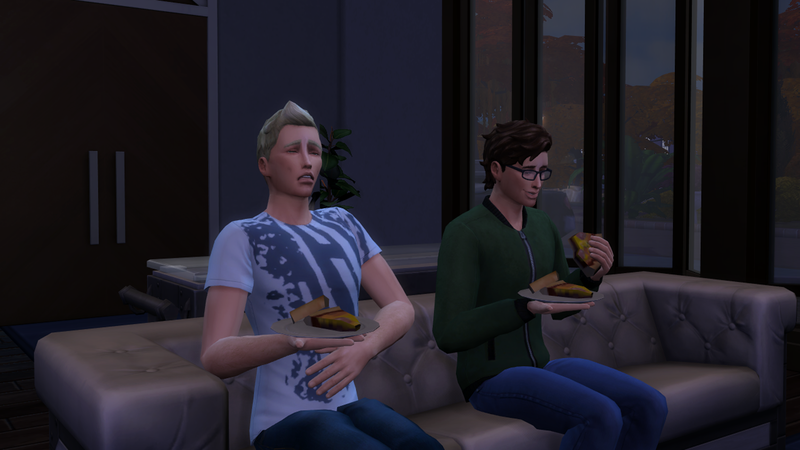 There are so many things we've had in previous sims games (and not only stuff added in expansions) that TS4 still lacks, even after 2 years. Obviously toddlers, but also the teens being exactly the same as YA's. 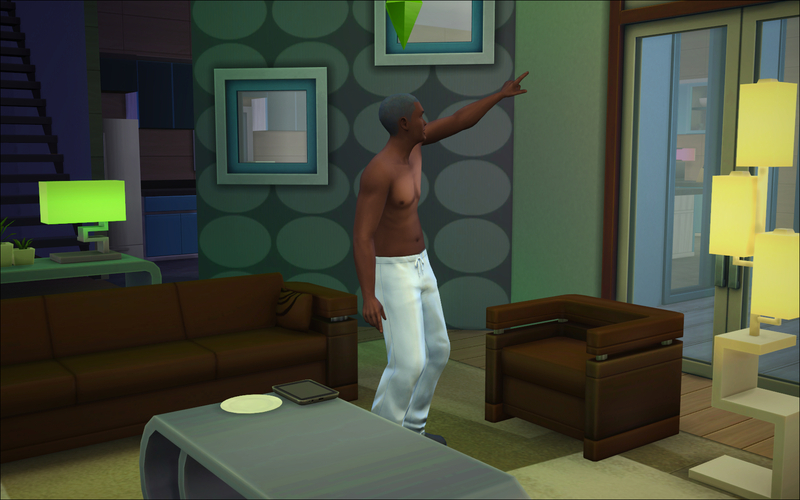 The constant loading screens, even just to knock on your neighbors door, it makes me keep my sims home all the time. 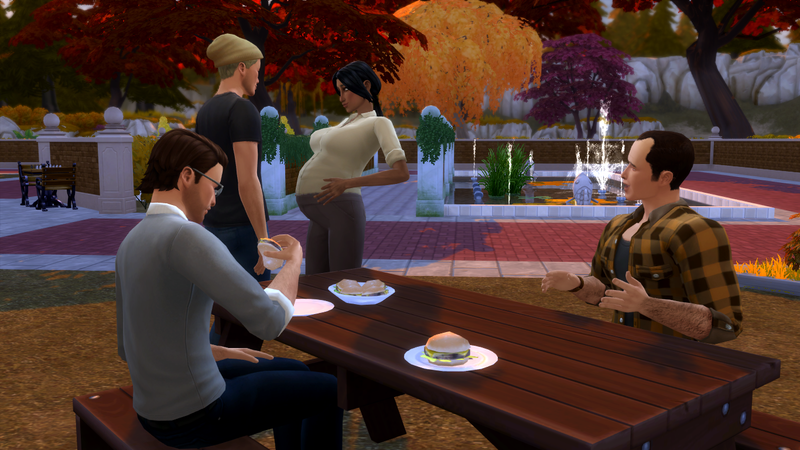 I loved the open world in TS3, but it ran horribly, so I'm not even all that upset we don't have an open world. It'd just be nice to cut some of the loading screens out, at least in the individual neighborhoods. I actually like a lot of the features added to build mode, but really miss the terrain tool. Flat lots and worlds really take away from the beauty of the game. Also making ponds is something I really miss. Then there's just a serious lack of unpredictability in this game compared to the others. 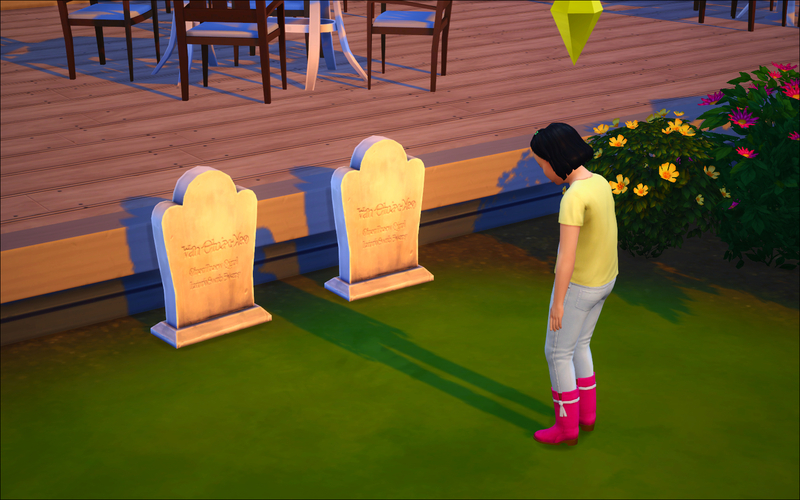 For example, my sims have never ever died of anything other then old age. 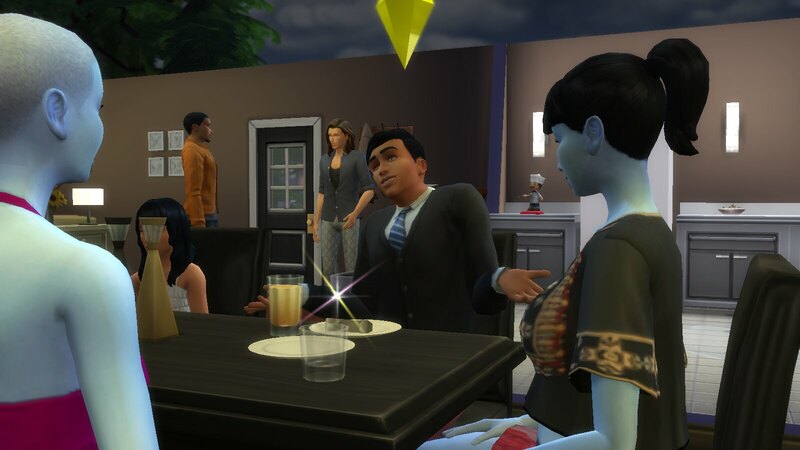 I had GTW for a full year before my sim was abducted by aliens, and that was only after I set abduction to high with the MC Mod. There's no robbers... it's a small thing, but another fun part of the game that I really miss. 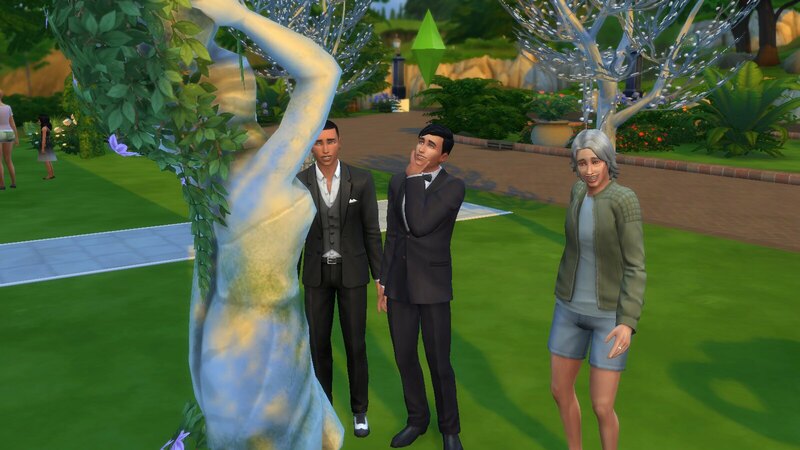 I don't know if it's just me, but my sims never really have any personality. I was definitely hoping to see Seasons, or some kind of Family based EP next. 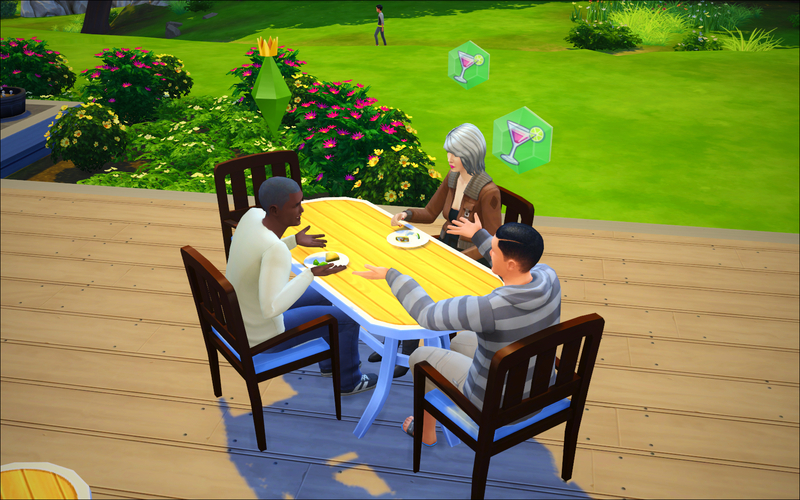 It's been so long since Get Together's release, and while they added a world I really love, no other new gameplay was added that I was super excited about. Then there's Gamepacks, which are just a way to rip us off in my opinion. All of the content added in GP's would've previously been added in EP's. 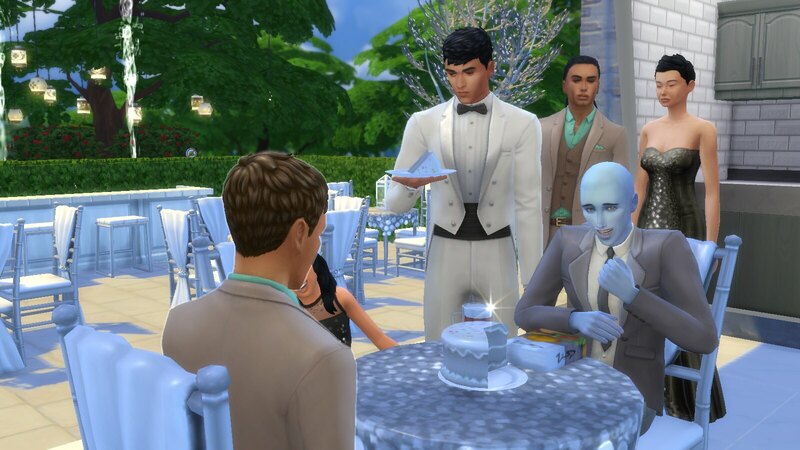 It's just upsetting because I really really really love The Sims franchise, but it feels like EA/Maxis can't, or won't add things to the game that 90% of their fanbase has been asking for since it's release. 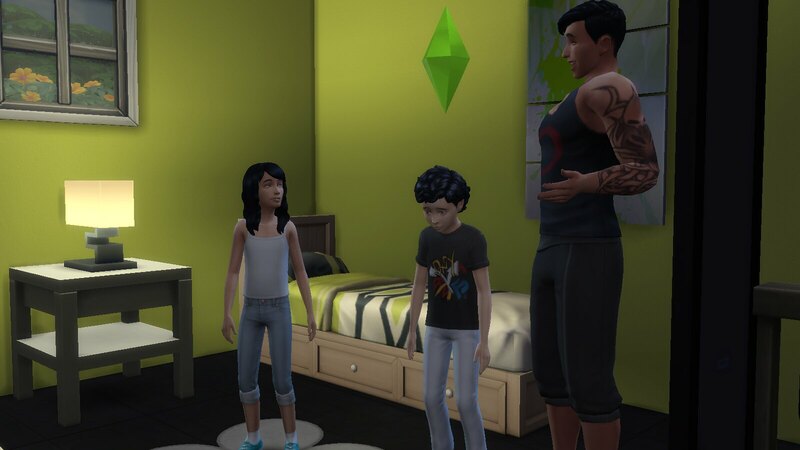 The Kids Stuff pack was a dream come true to me, but I've lost all hope we'll get anything like it again in the near future. You mentioned you thought the new EP might add more diversity, and I think you're right. 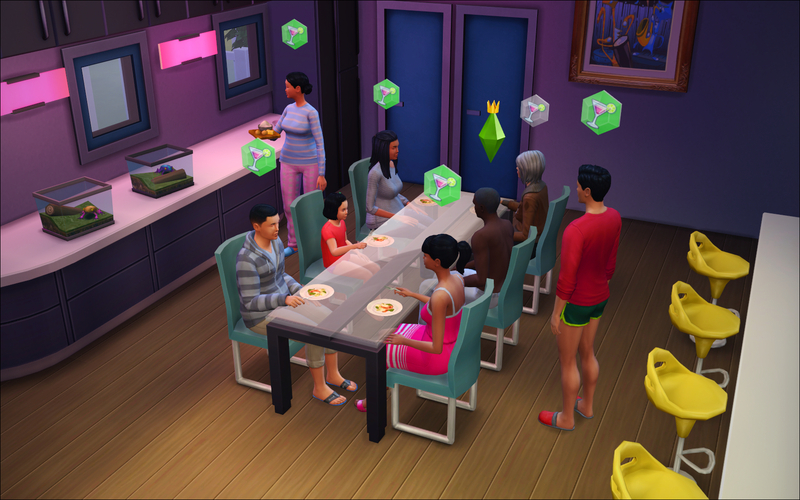 I think they've done a really great job making the sims more diverse in TS4. 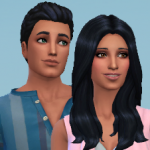 It's my least favorite of the sims games, but the actual look of the sims themselves are my favorite. 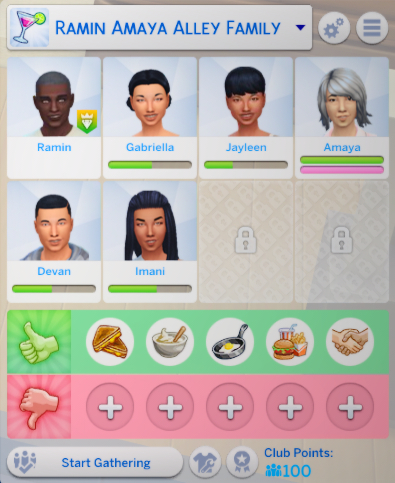 All of the hairstyles, and clothing options are really well done. 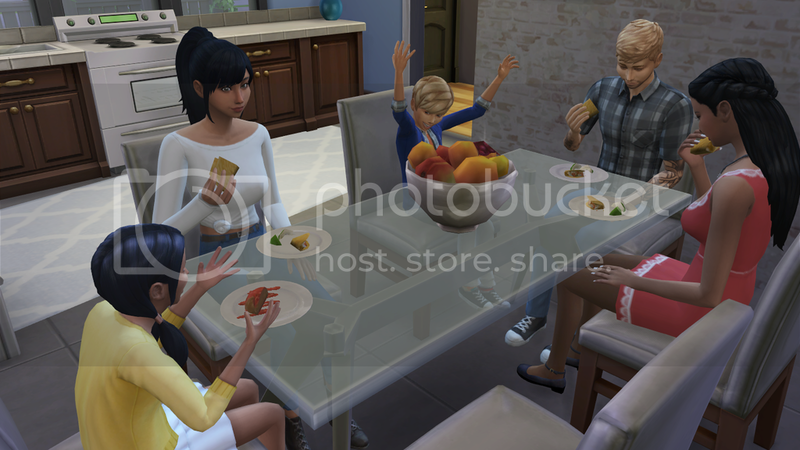 While I won't be buying it, I'm really hoping City Living will bring people back to the game, at least in this thread. I miss everyone's constant updates, and I get so much inspiration from seeing how everyone else plays their game. Sorry for the long rant lol I'm done now. 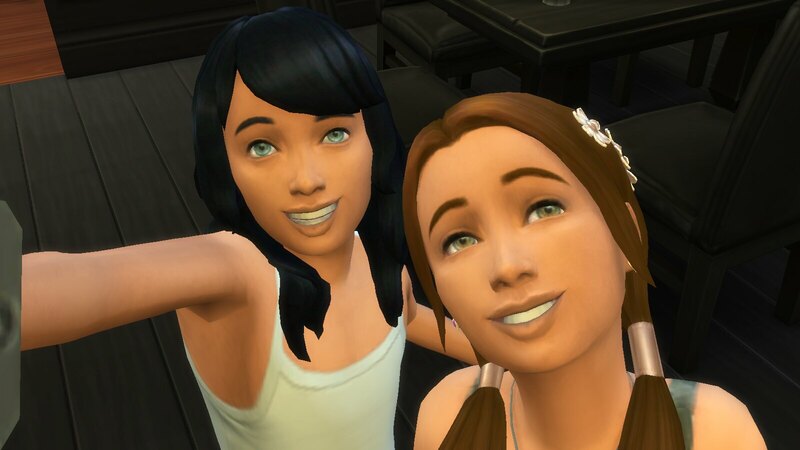 @soulfull - I agree, I think of you all as my sims family. I think once the new EP comes out the updates will pick up. I'm really bad at explaining things lol but I'm gonna try my best. 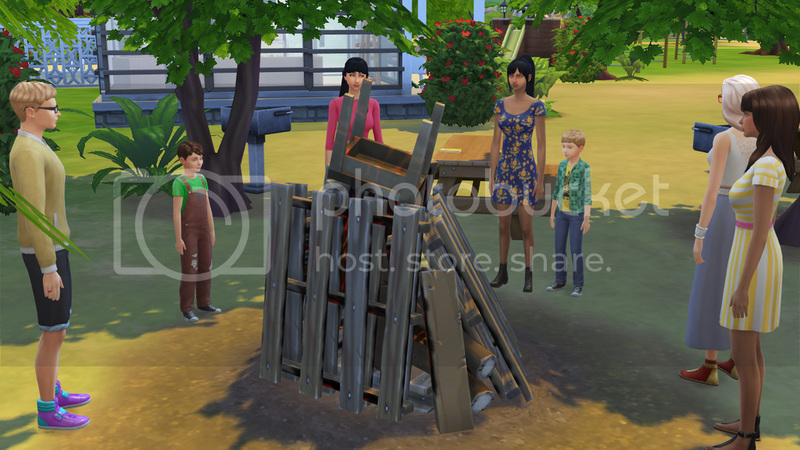 When I wanna test out a new building I've built for the challenge I save it to the gallery. Then when I load up my game the next time I click on "new save" or maybe it's "new game". Then I just place the lot down where I had built it in my challenge world and place a random family/sim in it to test out how it'll run. Once I know it functions well I click "save as" and name it "Test World". That way I have two separate game worlds and I know my challenge family and world won't get messed up because I'm using a whole different save to test builds. Did that make sense? 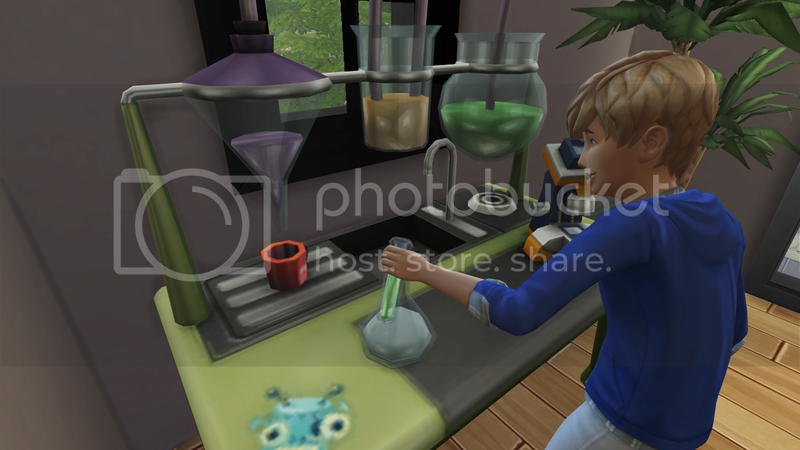 @debjameswhite - I think you definitely get more attached to sims when you play them on long lifespan. 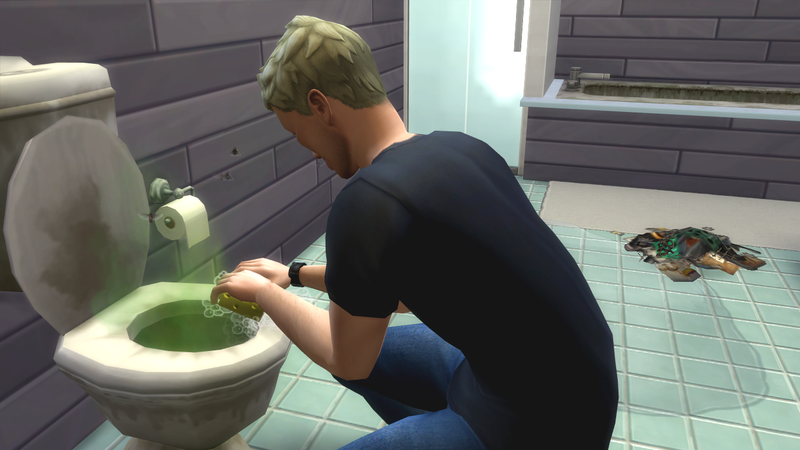 The same way I didn't grow attached to some of my sims when I played them on short lifespan. 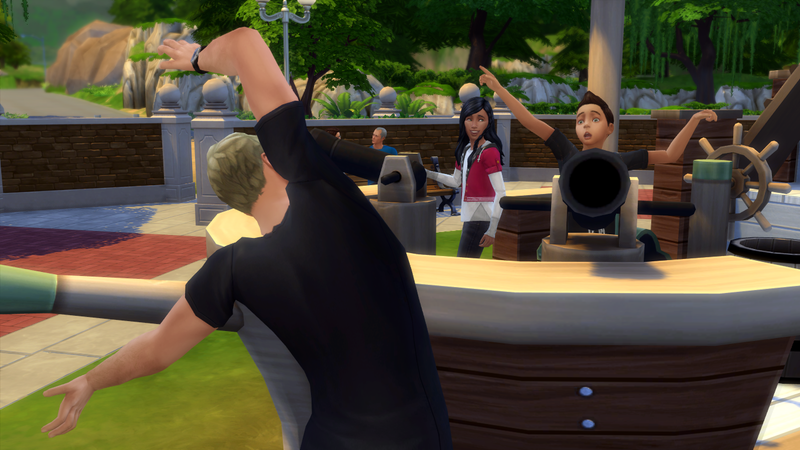 I hate that you can't collect sims urns if they don't die while you're playing them, but in Oasis Springs I'm determined to have all of my heir sims urns. Good luck moving Saul and Lily in before it's too late. Speaking of Saul he looks so funny with his grey and purple hair. It'd be a shame to change it though, I totally think of that hairstyle being his. Welcome Joshua and Caeden! I look forward to seeing them compared to their siblings. @JordanNicoleJJ - I'm so jealous of you getting to go live the college life. I jumped right in to marriage and babies when I was 18 and in my freshman year of college lol You're gonna have so much fun, and I'm sure you'll nail your test and be starting in January. Oh and no we didn't buy the house, just renting. At 26 and 27 owning our house is still a big dream of ours. We try to save a little each year to put towards a down payment, so maybe in like 5-10 years we'll be living like true adults lol! The CC purge feels good huh? 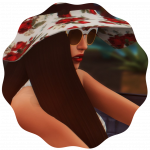 Too bad I've now found tons more CC I wanna download. YAY AN UPDATE! lol it feels like it's been so long. I love the autumn mod. Noah and Owen's skills are both so high already, I'm impressed. lol @ poor old Derek getting kicked off the team. At least his sons are nice about it. 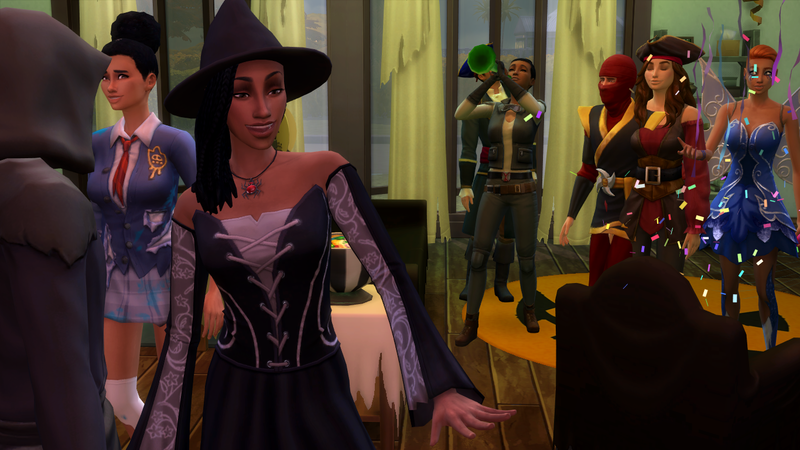 Your Halloween party was perfect! I've never really wanted that SP but now of course I do. Also why the heir regret? 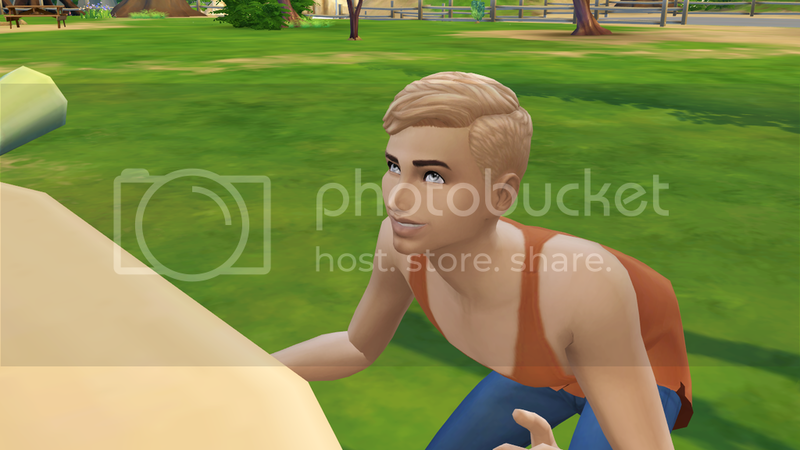 Noah's such a babe, and I think he and Violet's babies have some serious potential. Owen's a cutie too though so I don't think it'd be a mistake to go with him. Go with whoever you have more fun playing. @OJenn - Were you able to get the other family tree site to work? Every time I've tried and signed up it never takes me to where I can create a family tree. 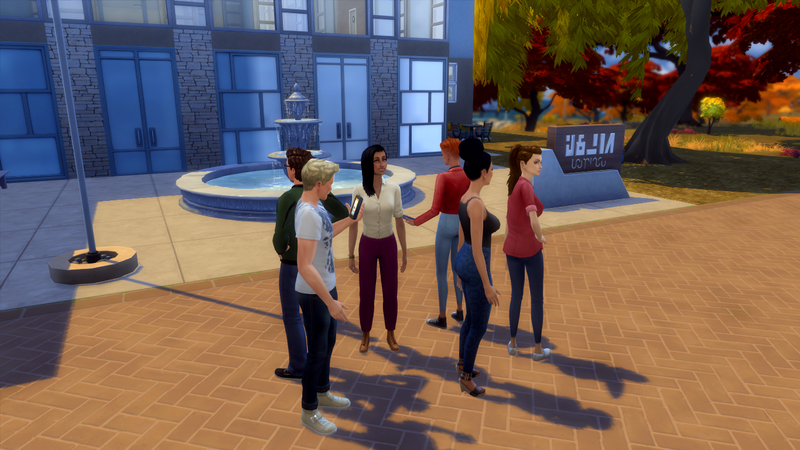 I really like the look of it so I wanted to use it for Oasis Springs. 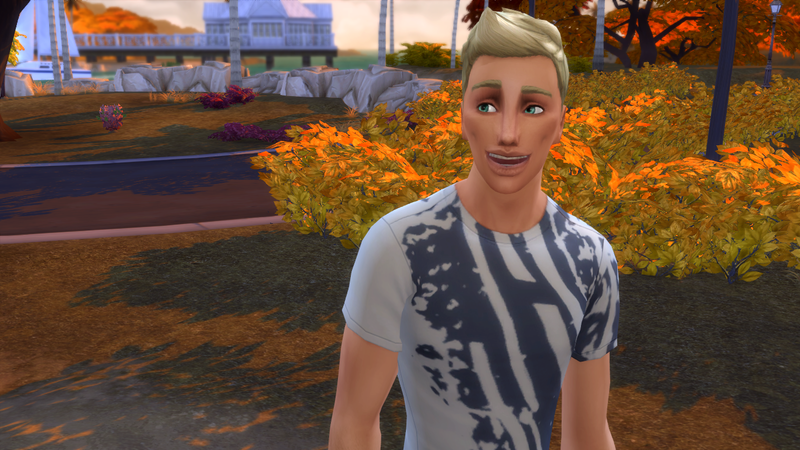 I think your Willow Creek looks gorgeous, especially your shopping district. Daniel is so handsome! 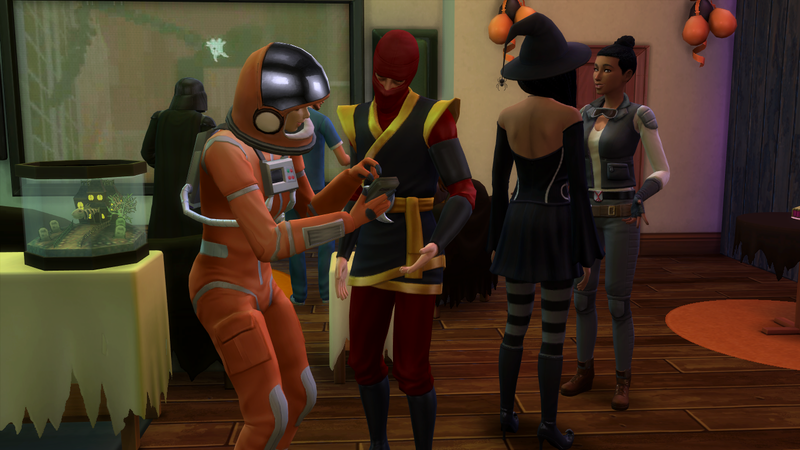 Also great party, you're really great at throwing your sims parties. Mine don't even know what they are lol! Hi guys! I'm terribly sorry. Again, it has been way too long since I posted comments or an update. I started my new job about a month ago, and the first weeks were slow, but now I'm starting to get busy. And everytime I do have time to play, I end up doing other stuff. It's a lot of adjusting still haha. Anyway, I'm trying to get back, starting with a comments post! @QuiteIzzzy Kai and Amaya's first day as newlyweds seemed so peaceful. I'm glad Kai has cleaned up his act. Birdy is cute I laughed at Amaya passing out after all the fun, must be hard on a pregnant woman. And awww babiess They sure know how to keep their parents up. Kai is so sweet with them. Lucy is kinda sweet in all her creepiness, wanting to protect the family. But I'm sure thing are going to blow up eventually. Poor Amaya. Birdy is great too! I'm happy she chased Jenny off. 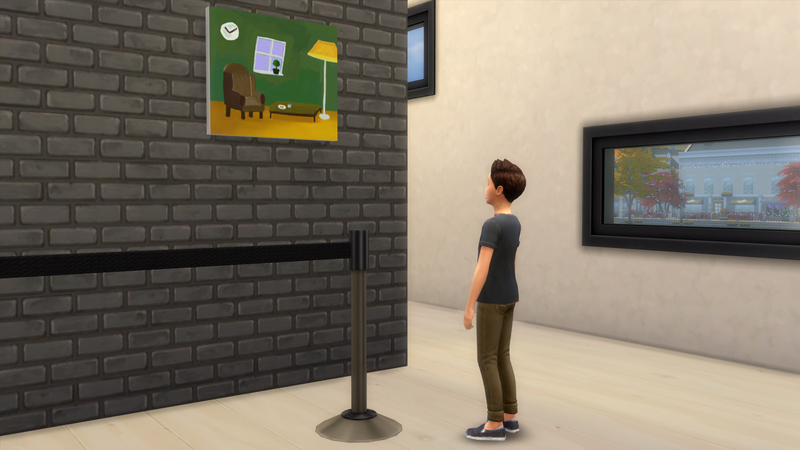 Oooo the Art Gallery looks great! @kitoraem I think Suzie is just an adorable name. Her and Thomas are really cute together too. And I love their first child, Vanessa. 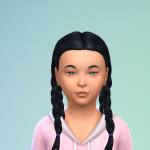 I'm super curious what she is going to look like as a teen. I'm not at all surprised that Rosa is DJ'ing for a hobby. It fits her, haha. She is plum. Aww, I just read now that you had computer issues. Too bad you lost your save I really liked your family. But Oliver and Maria are pretty too! I love redheads, so I'm a fan of Maria already haha. 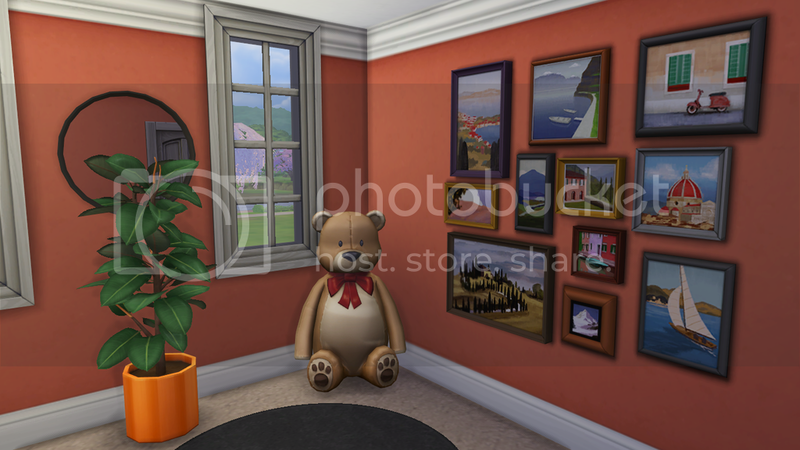 @debjameswhite I used a mod to create Granite Beach. 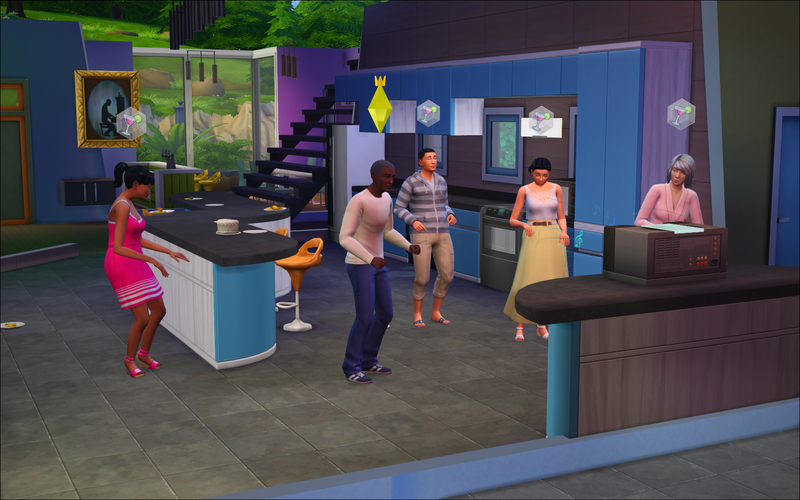 It's the Tropical Getaway mod. 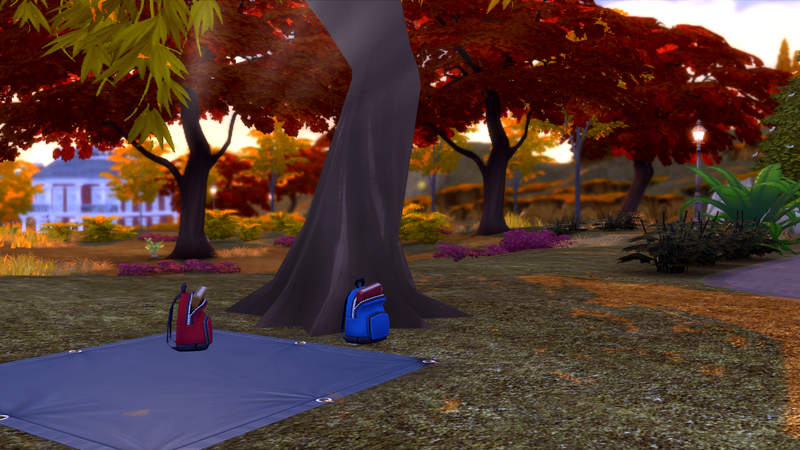 It's basically an overlay of the existing Granite Falls, I've wanted to use it for a while now, and Hymn and Wei could really use some time away The beach seemed more their thing than the original Falls. Aww, Sauls insane man blues I still love him haha. It's good that Logan cheers him up. And the new grandbaby Liam is a cutie! He also gives me memories of my own Gen 3 Liam Wooo! You're real lucky this generation, three single births. I'm happy the last one is a girl. I always seem to like girl kids more haha. Too bad brother Liam is mean But luckily the girls have each other. Kenzie's an elder already? Sweet J. that's fast. LOL the picture where Catherine is wearing the bed... I think you accidentally used Testing Cheats Enabled and added it to her head? You can reset the item and then delete it in Buy Mode. But I'm guessing somebody else already helped you out by now Huh? I just now see the rest of it. That is weird... I haven't seen anything like that before! Did you fix it? @OJenn Haha, the Granite Beach mod is awesome. I used Tropical Getaway though, not Life Is A Beach. It's the same creator, but the Getaway overlay is more advanced I believe. I can recommend it. I wanted to use something summer-y one last time, before autumn. 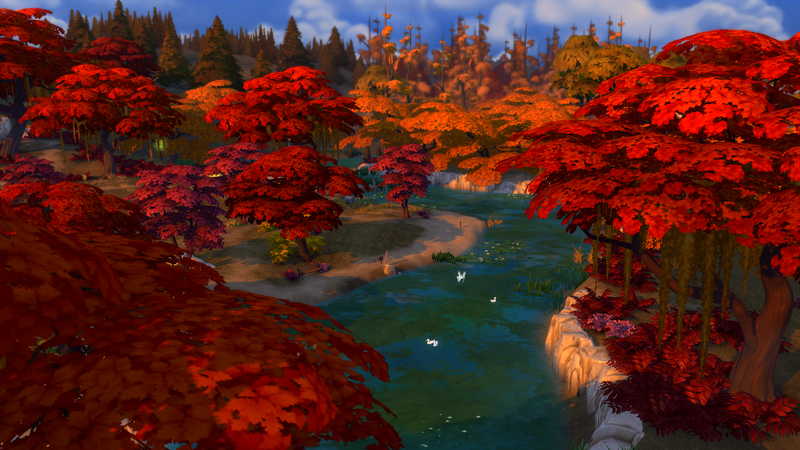 I am thinking about using the Autumn mod now because it's really pretty in everybody's game. Oh man, I can't wait till they bring a Seasons pack. 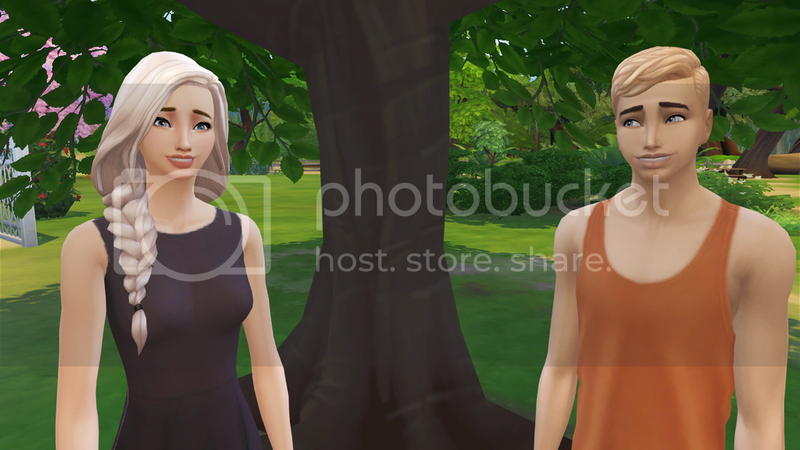 Wow, your Willow Creek looks amazing. Especially with Reshade. I got it working with all your tips btw, but Hymns bright hair looks really weird when I have it enabled. So I'm back to original lighting I'm so sad for your family and the loss of Gary. He really was their rock, wasn't he? It's good to see the girls are coping. 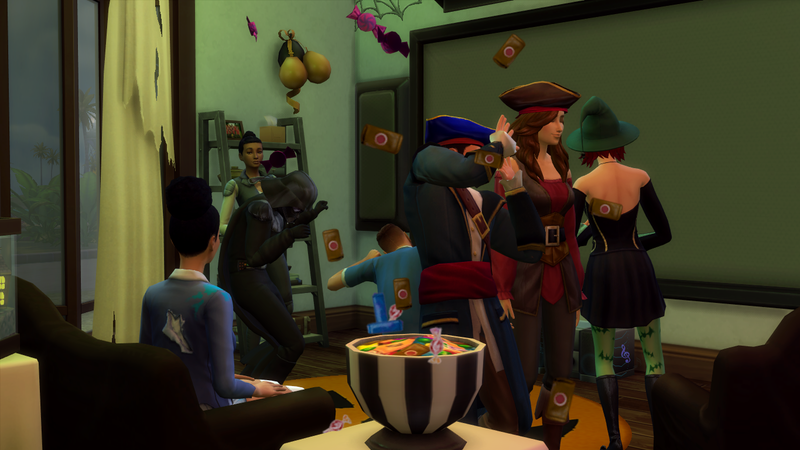 Their partying looks so nice, wish I could join them! Daniel and Charlotte are a great looking couple. I'm rooting for them. I'm gonna miss Audrey though. @Heckstress17 Thanks for linking me to the baby skins, I downloaded them. Haha @Tellex should bring us new skins! They were adorable. Don't worry about not commenting on the hospital-update part. I'm just happy people read it haha. I'm always to hard on myself when it comes to writing. plum insecurities. I'm not sure Wei and Hymn will only have Elara, since Hymn has the Big Happy Family aspiration. 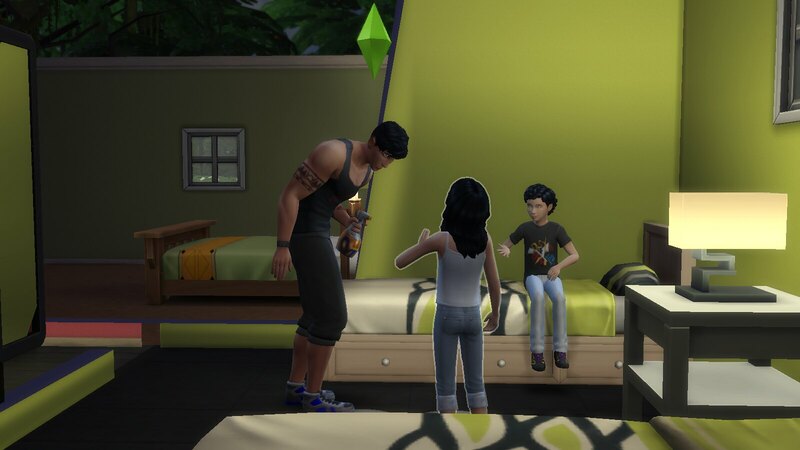 I think it's gonna be almost impossible to keep her from Trying For Baby with Wei The world is really Granite Falls, but with the Tropical Getaway overlay. So it's not in the pack naturally, somebody made it It's still beautiful though! I was so happy to see you post an update. 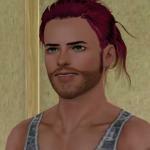 Shane looks amazing with his new hair, I don't miss the old hair one bit LOL, Hanzo setting his room on fire. Oops. 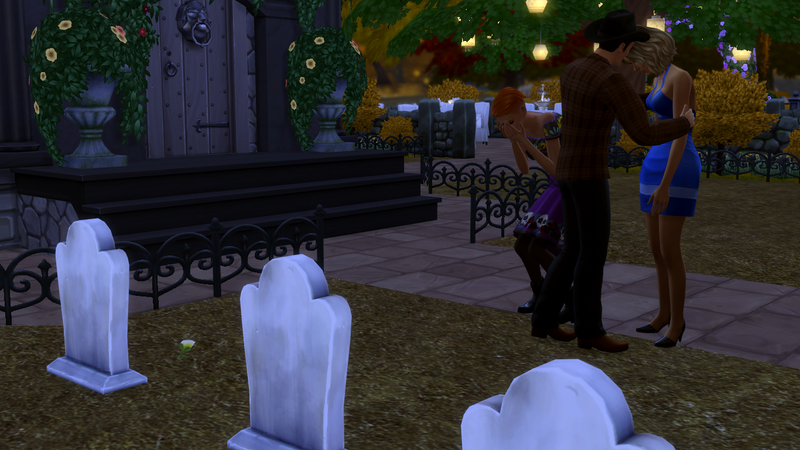 Your Day of the Dead sims are pretty! I saw the challenge, but I haven't played it yet. I really should. Maybe I can get in some play time after posting this message. 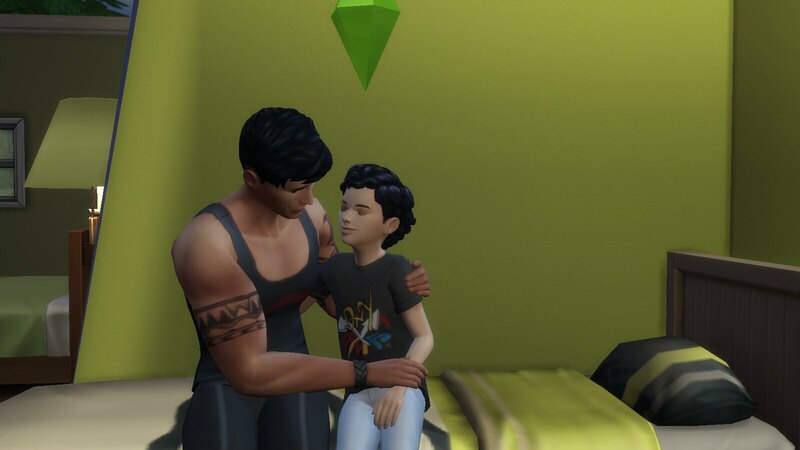 I think Genji is my favorite one of your kids. They are both super cute though. @Pwhiskers Hey! Welcome to the thread Your founders are gorgeous. 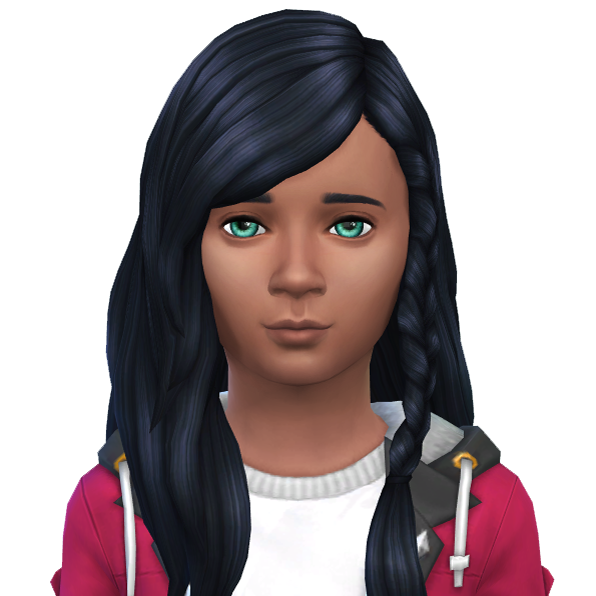 And Lilo... she's one of the most adorable kids I've seen in game! She reminds me a little of Disney's Lilo hehe. @amadazulsim Wow, a lot has happened to you! I'm happy it's all good things. Congratulations on the promotion/birthday/new grandbaby Yay for an update nonetheless! Huzzah, Paige for heir She was my favorite of Ona's kids. I am a little sad that Ona is already an elder. She was a fun generation. Daniel is super gorgeous, he and Paige will obviously make great looking kids. Oh and I see now that pregnancy is already happening Paige is like a model, she looks hot even with the big baby belly. 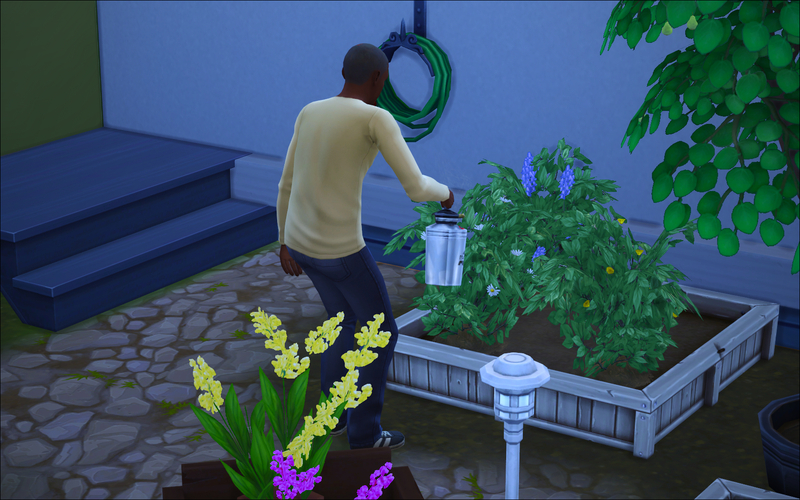 Oh dear, Daniel, never mess with the Cowplant! I'm glad he survived. Daniel is like the calmest dad-in-hospital I've ever seen haha. Oh wow triplets. I can't wait to see them aged up. I'll post an update of my own soon! I hope to play tonight But first: dinner! @Heckstress17 I'm excited for college, if only to get out of my parents' house, lol. And I need some better friends...all of mine are really negative, which doesn't help my depression Hopefully it'll be fun! As for the heir regret, Idk, I just think Owen aged up better. 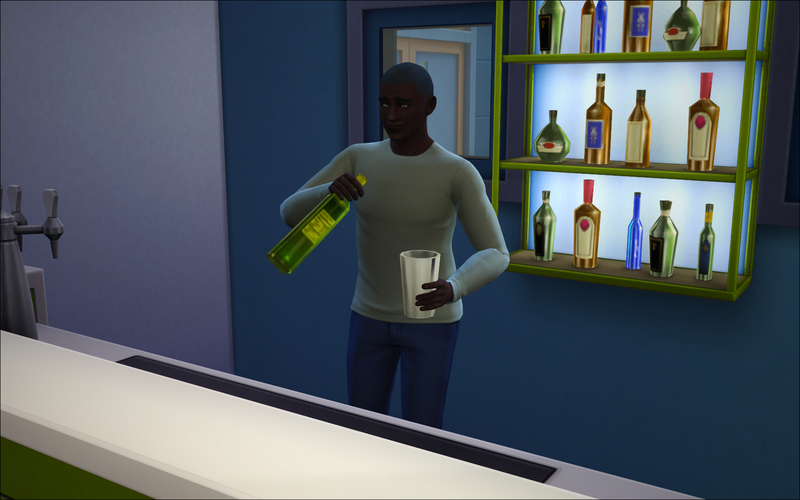 Noah's face is really thin, which looks odd at certain angles, and he got Absinthe's wide hips. On the other hand, Owen has his dad's body type, a stronger jaw, and a cute little dimpled chin...plus he looks great with a 5-o'clock shadow I haven't really explored the handiness skill, so I was excited to do that with Noah, but I've also never done the start-up entrepreneur branch of the tech guru career, which is what I plan on Owen doing... 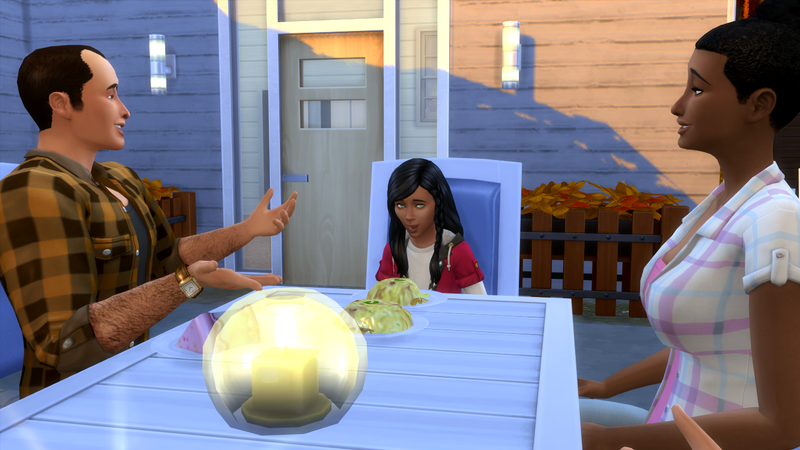 I love Noah and Violet, and I think their kids will be ADORABLE, but there's just something about them that makes me dislike playing them...they're too perfect I guess? And I don't really want to play a "perfect" couple right now. Regardless of who I choose, I'll play both families, so we won't miss out on either of them. Xara "So... when do you have to go back to heaven? " 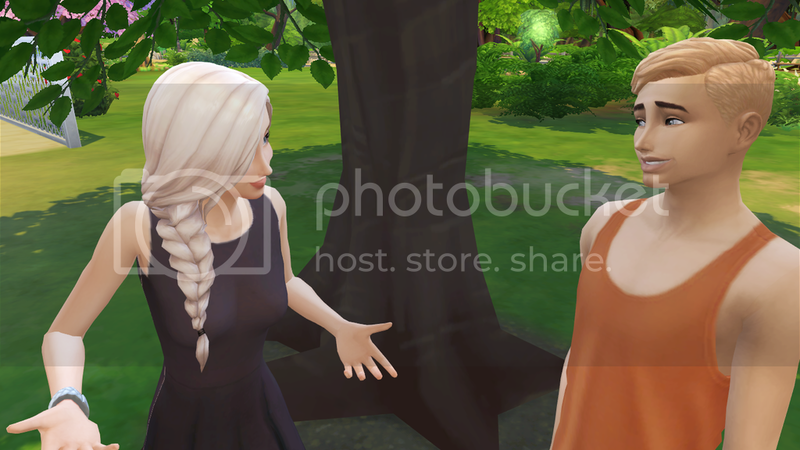 Xara "Well I thought it was sweet... "
At least things are going well for Elsa..
@JordanNicoleJJ D'aww. He's such a hard working cutie. I'm secretly (okay, not so secretly) very curious to see Rose enter your game and hopefully woo Owen. I'm also excited to see what she looks like in your game. Oh of course, Spooky Stuff. 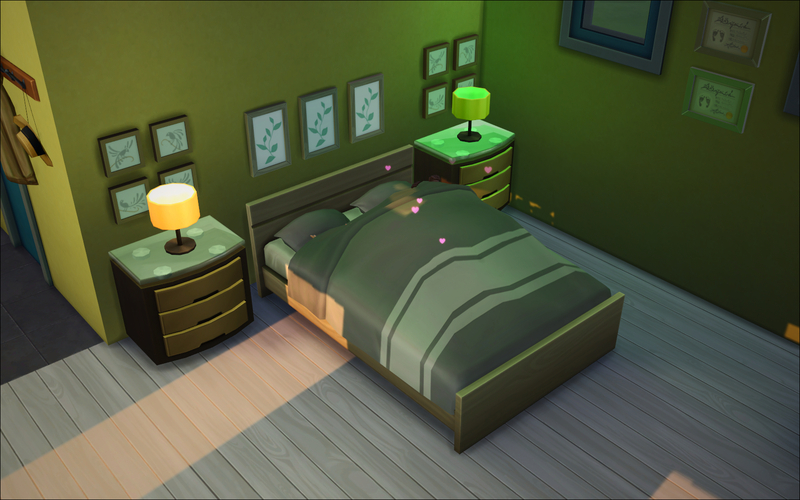 I never use decoration from that pack, because it's not stuff you use in daily life. But for Halloween... yasss! 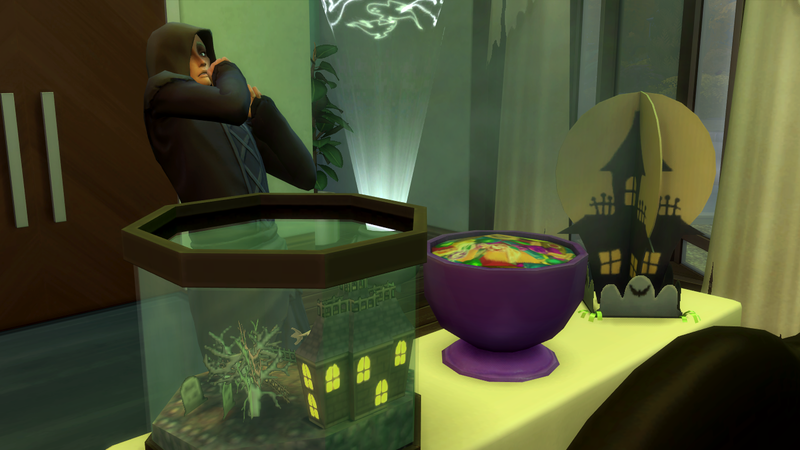 I'm going to have my simmies throw a spooky bash soon too. Heheh. Smart, the fiddling with the lighting. I sometimes do that for weddings to get a softer and more romantic lighting. I'm ready to post an update of my own! Okay, so last time around Hymn and Wei got engaged on their last day of summer vacation. 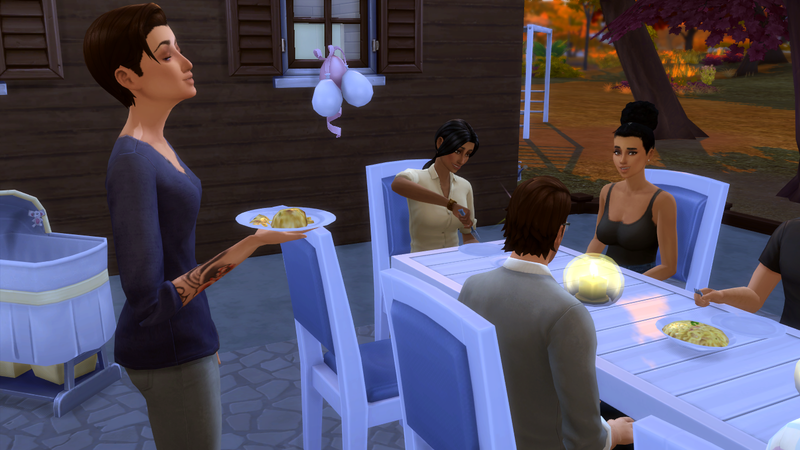 For their last evening, they took Elara out to dinner. Also to tell her about mom and dad getting married of course. And Elara was super excited to hear she was going to be a bridesmaid (even though I didn't get a pic of her response). Hymn and Wei made good use of their last night of peace and quiet. 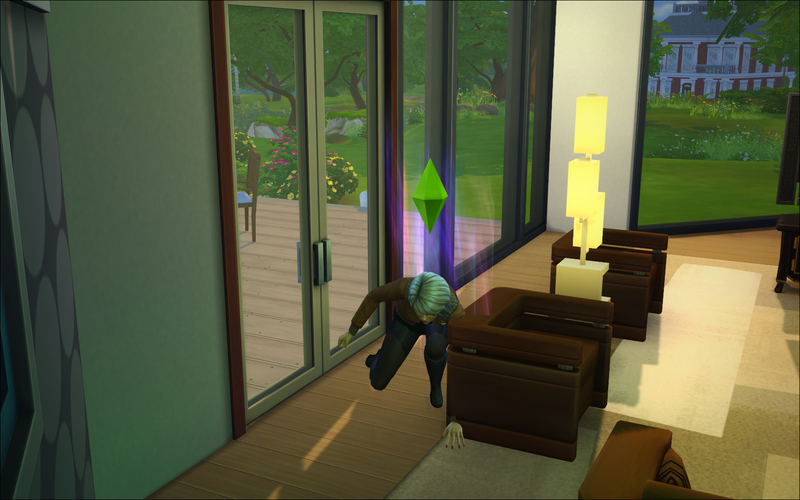 The following day, while making breakfast, Wei had a little freakout. I'm not sure whether it's because the end of his vacation is nearing, or wedding jitters. Luckily, he calmed down soon. 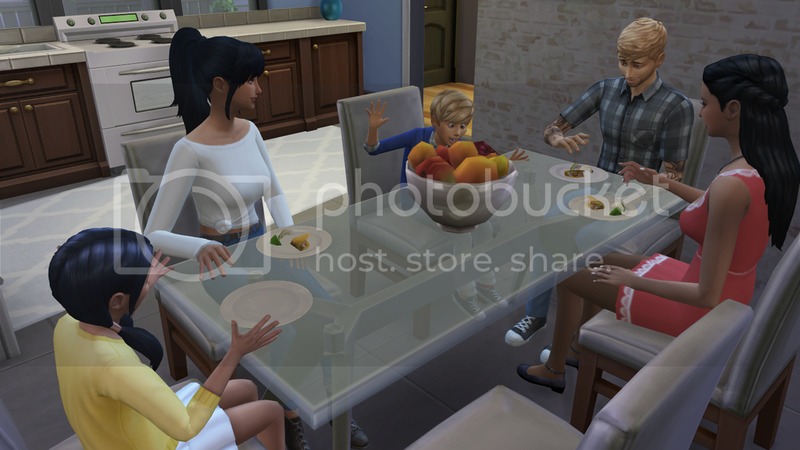 The family enjoyed one last breakfast in their cabin, before heading home. 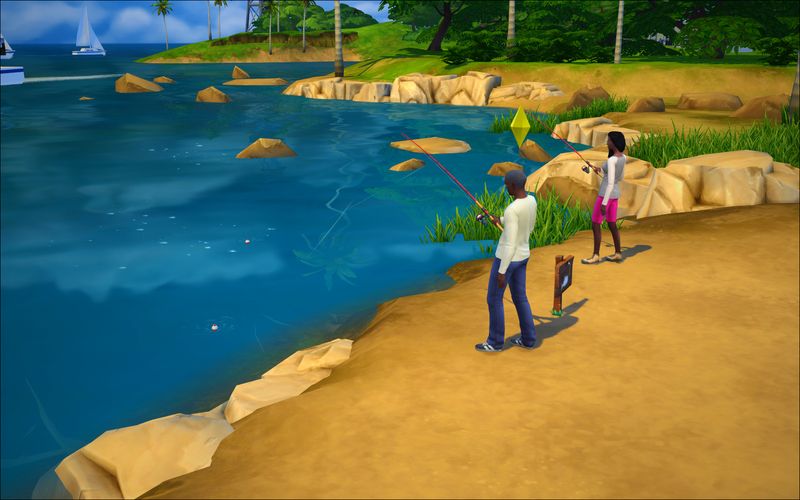 Despite them returning to Willow Creek, they did have two more free days. Their holiday ended during the weekend. Elara spent her free time working on her art. Wei and Hymn did... other things. Hymn also rolled the whim to be mischievous to Wei. He facepalmed and she looks super cheeky LOL. She also did an evil laugh. Errm, who's the evil one here, Hymn? 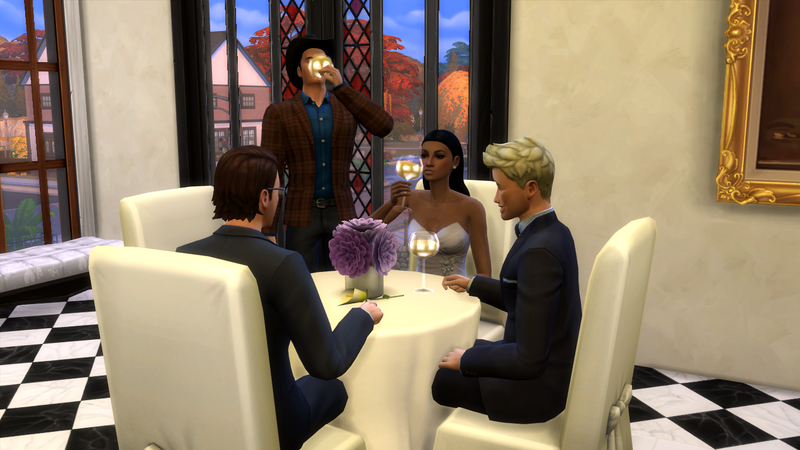 And on sunday, they decided: hey, why not just get married today? 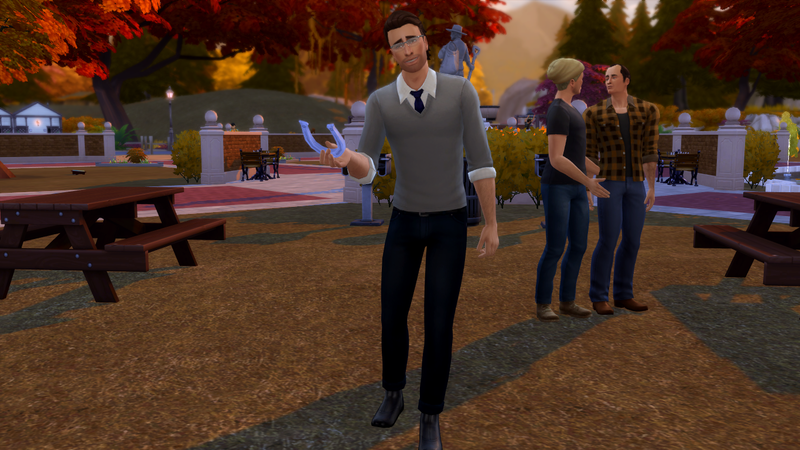 So they invited everyone to a romantic park in Newcrest. Wei admires his bride even when she's working on preparations. Everyone made a beeline for the bar. Figures. 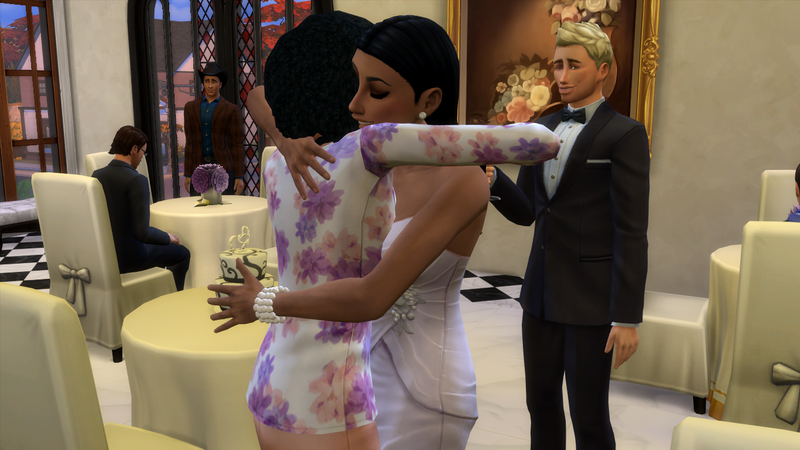 Jimi is very happy his baby sister got through everything and is now marrying the love of her life. Oh and meet his and Jana's baby boy I forgot his name though, it was something with an A. Of course, the guests wouldn't sit down, but that didn't disturb the blissful couple. The bride and groom. So in love. 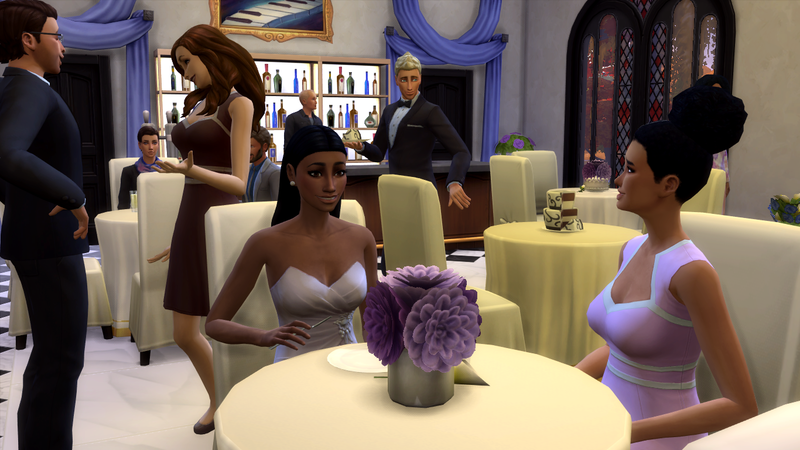 Guests having a good time. Well, except for Elara, who got sick. Poor thing. I got less pictures than I remembered, but the party was a success. After the ceremony and dinner, guests danced the night away. Except for Hymn and Wei, who only had eyes for each other. They ended their wedding on a very positive note. No wonder it scored gold. A little outtake of the gorgeous bridesmaid. 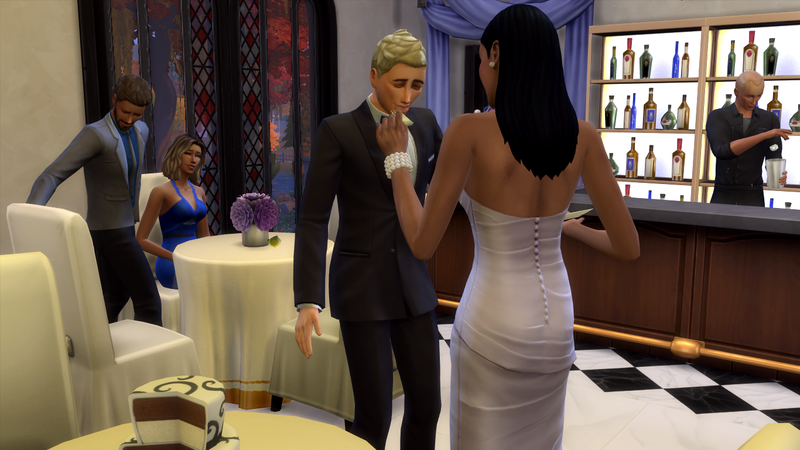 Plus an overview of the wedding location, since I forgot to do one at the beginning. 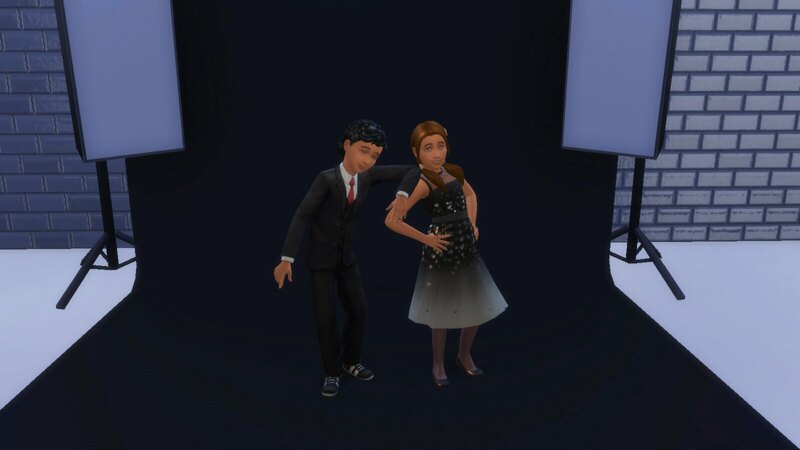 Jarvis and Melody are expecting another baby. Same goes for Jimi and Jana. And Prince recently became a father for the first time. I'll leave you all with this picture of Wei freaking out once again. He's married by now, so that can't be it Still funny though. @Francisca464 I don't use Spooky Stuff very much either, but 'tis the season! 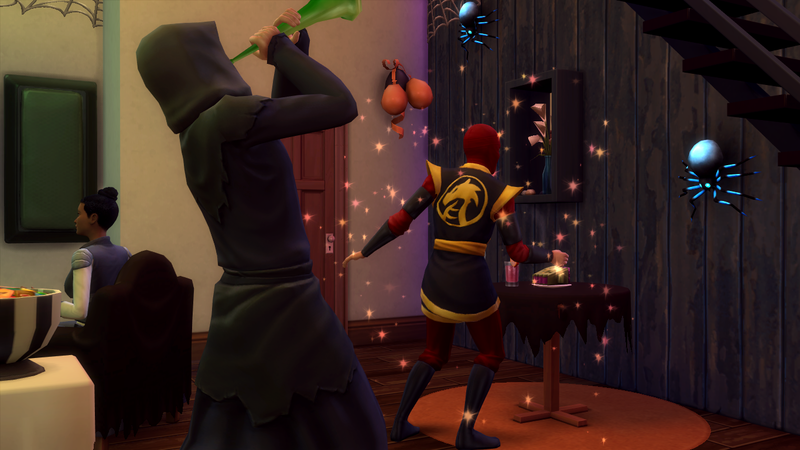 ;D Can't wait to see your spooky party! LOVED that wedding--that picture of Hymn standing under the arches is perfect. I really liked the dancing shot too; the arches and checkered floor look so cool (well, the whole venue looks cool, really). Jimi and Jana are my favorite couple this generation (don't tell Hymn, lol! ); their little boy is ADORABLE! Melody's daughter is really cute too--yay for alien cousin-aunts, lol! Are you planning on Wei and Hymn having more kids now? 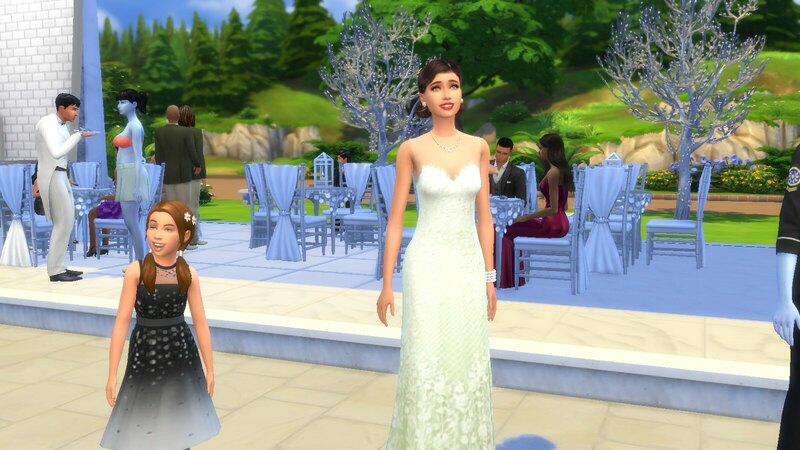 Newly graduated with too much free time on their hands, Violet and her best friend Ciara went wedding dress shopping (remember Noah "proposed" when they were teens). It didn't take long for Vi to find the perfect dress. The boutique also does hair, makeup, and accessories--so she got everything settled in one day! Meanwhile, Derek and Noah went to Pauline's Pastries to order the cake. 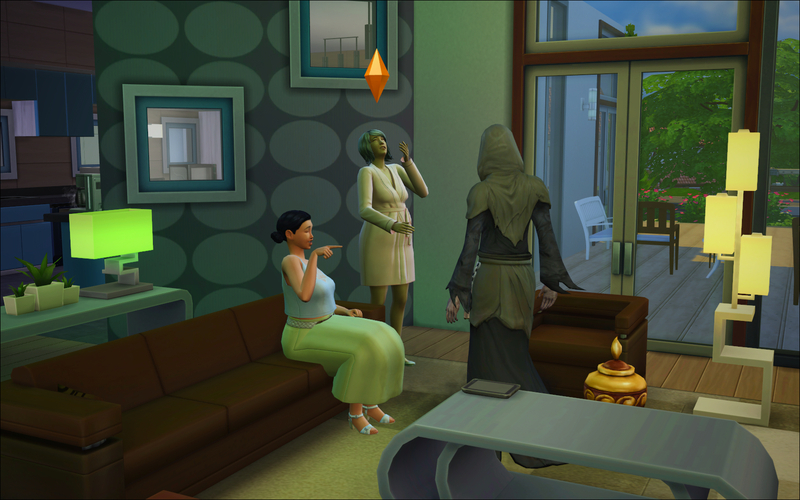 Derek enjoyed catching up with his sister- and brother-in-law, whom he hadn't seen since Absinthe's funeral. The wedding was held at the local chapel. 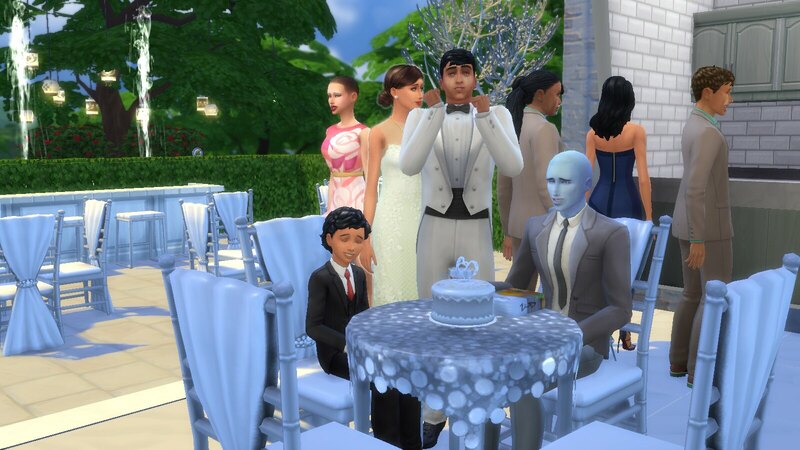 All of their friends and family were invited. 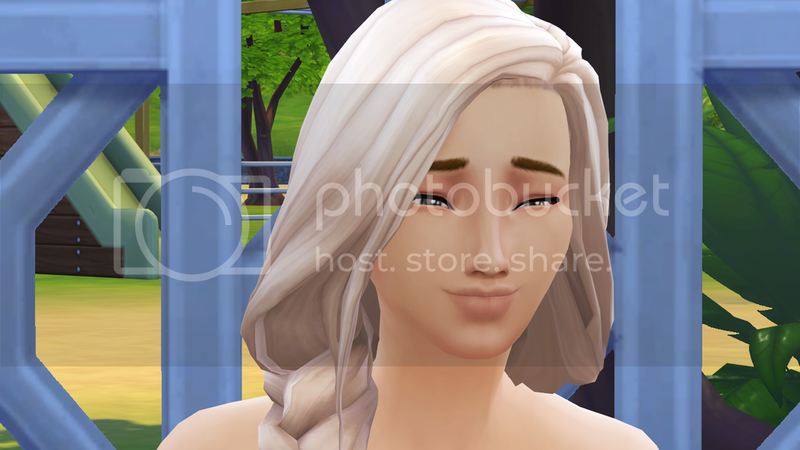 Noah thought she'd never looked more beautiful than in that moment... You really lucked out, Noah! 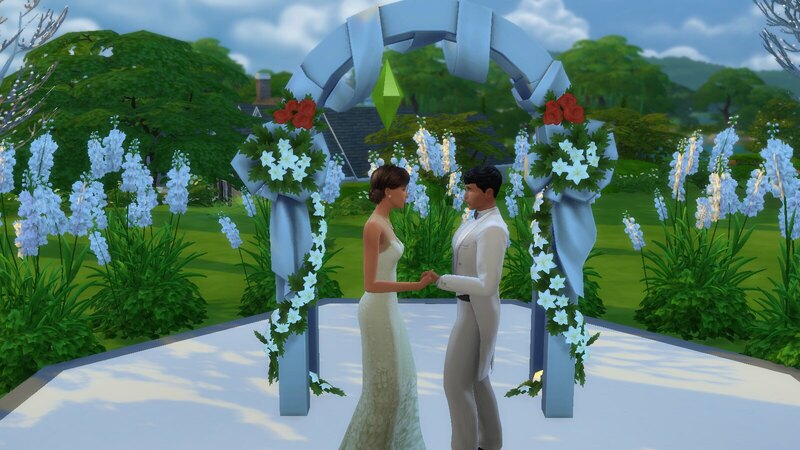 You may now kiss the bride--quick, before she realizes she's way out of your league! Derek gave a lovely speech at the reception, then led the toast. Violet's mom squeezed in a congratulatory hug before they cut the cake. Eclaire and Benedict arrived with the cake just in time! 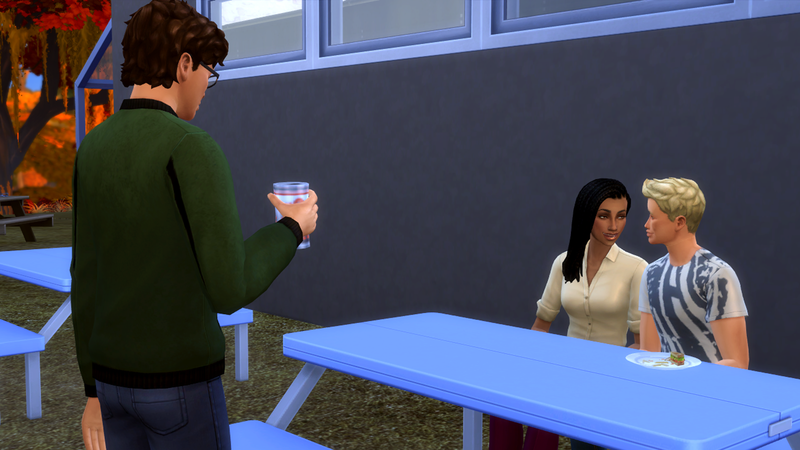 Owen got to catch up with Janette, whom he hadn't seen since the spooky party. He told her she looked amazing, but she didn't take the hint. Meanwhile, Ciara's like, "Girl, here comes your man with another piece of cake." And Violet's like, "That's why I married him." 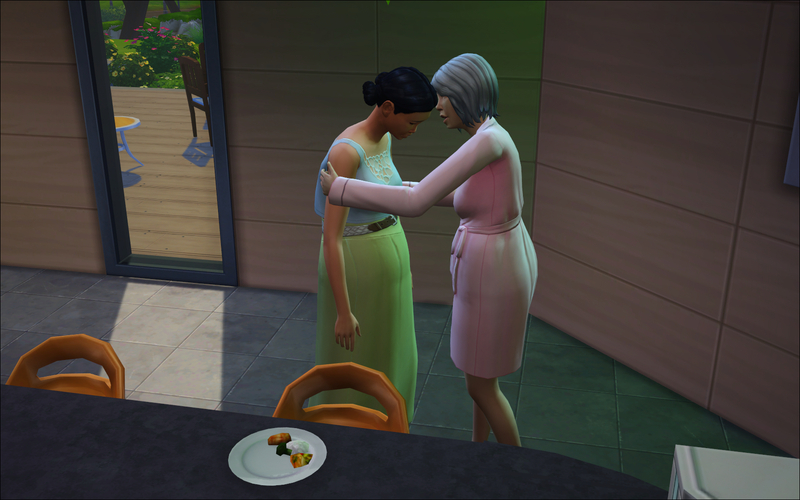 Amos passed away just before the wedding, so the family made sure to pay their respects and comfort each other during this hard time... Amos' daughter, Elliana, who was always a little gothic to begin with, is taking it especially hard. 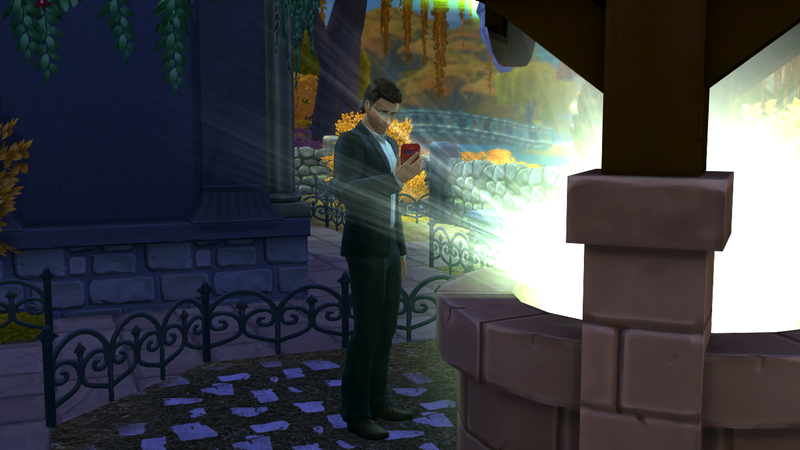 Owen was upset about striking out with Janette, so he made a wish at the supposedly lucky wishing well...and right after, his boss called to give him a promotion! I guess we know his priorities now, lol. 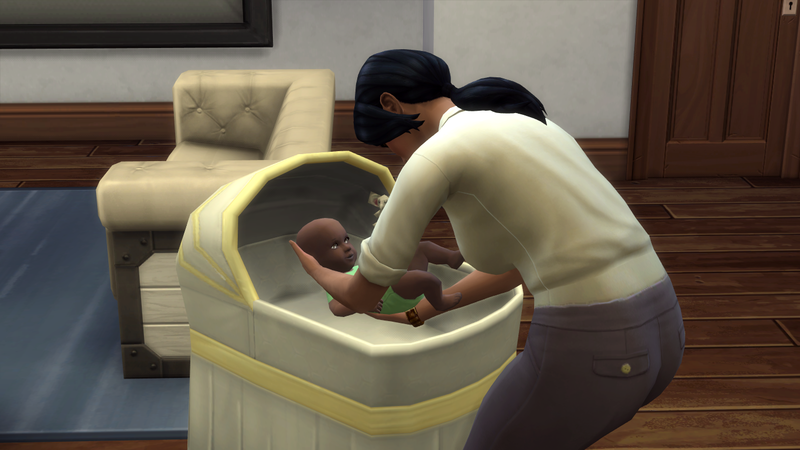 Noah wanted to start a family right away, so it wasn't long before Violet became pregnant. The local art gallery hired her as part-time help, just cleaning brushes and palettes, but she enjoys it nonetheless! Plus, she can paint on her breaks! She completed her very first masterpiece--a still life of fruit. Realism is her favorite genre to paint. She also has a painting of pottery in the still life collection downstairs. Ciara also has a painting on display--her work is more impressionistic, sometimes bordering on surrealistic. 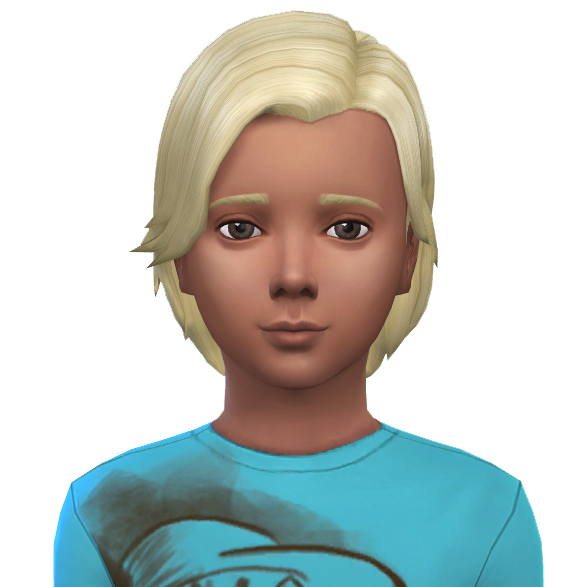 The kid is Amos and Hennah's son, by the way (I had no idea she was even pregnant). Magnolia Park got a major renovation... I loved the old park, don't get me wrong, but it was a touch laggy with all of the flowers, and this fits my more minimalist style better. To pass the time, the family spent the day there--she's ready to pop any second now! Noah grilled up some burgers for dinner. The boys tried to get Vi to play a game of horseshoes with them, but she just wanted to go home and take a nap, poor thing. All in all, it was a great day--Derek and Noah both LOVED the family time! Back at home, Violet barely sat down to rest when she went into labor. A long few hours later, they welcomed a baby girl to the family. I didn't have a name planned, so I used the randomizer--Yaretzi, "Yara" for short. The days flew by and it was time for Yara to age up! Friends and family were invited over--Derek was thrilled to catch up with Margaret, and Noah made sure to show "Gram Adams" all of Yara's cute baby pics. Violet got one last cuddle in... "Who's my big girl? You are! But you'll always be my baby, no matter how big you get." Noah's mac n cheese and pink birthday cake were a hit! This is a great idea, but way to complicated and time consuming for me. I may just bulldoze the buildings in each world and start from there with some singles or couple I already have made. 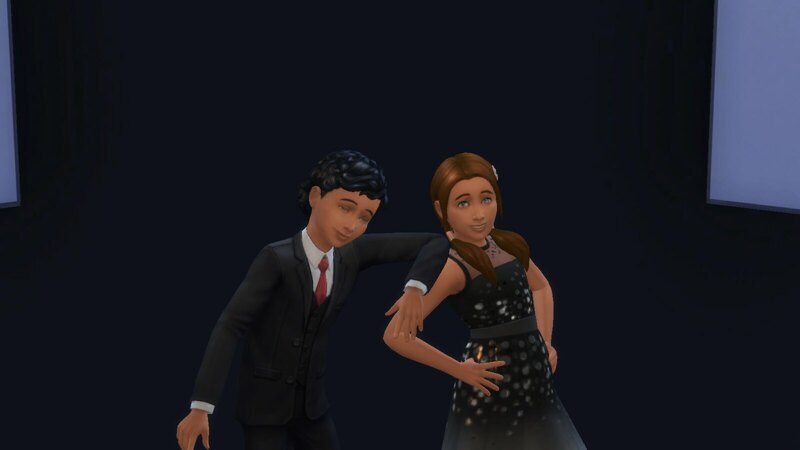 @Heckstress17 I can't wait to see them as teens too...I don't know who my heir will be! I know so far I'm not super excited about the oldest 3. Catherine is pretty...and Liam is ok too...I just don't know!! @Francisca464 I fogot you had a Liam until you said that! Awwww....too bad mine is mean! hehe Kenzie is not an elder. 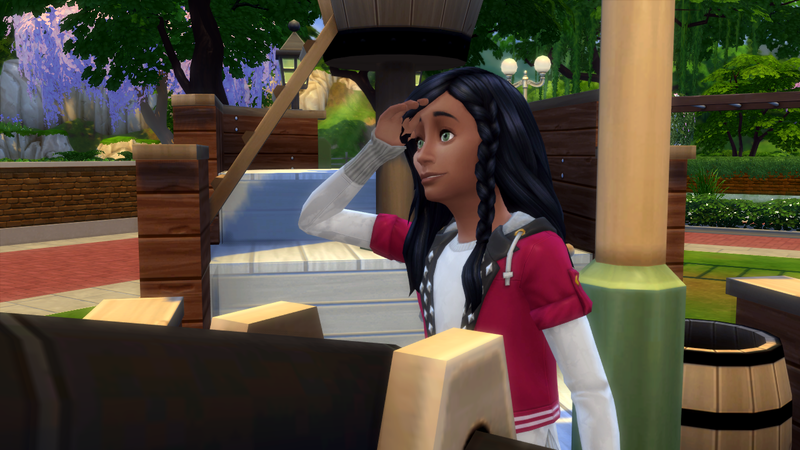 She's still a Young Adult...It's Lily who aged up but they are very similar in looks. 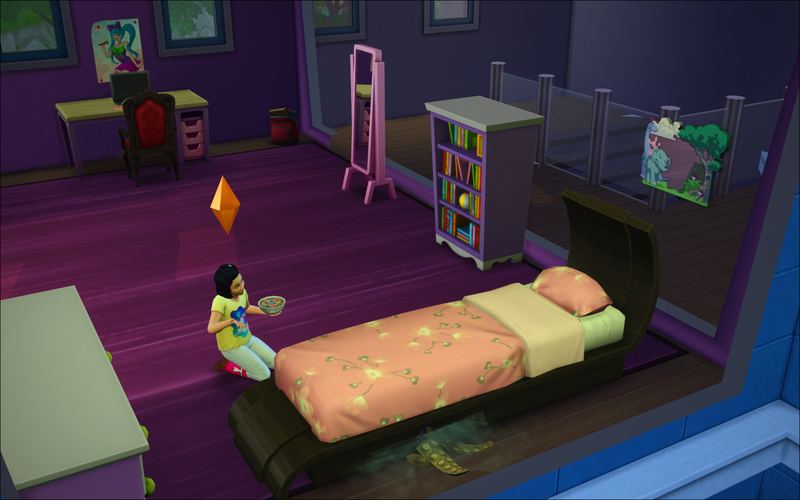 I did get the bed off of Catherine's head by sending her to school but now it's stuck on a lot and I can't delete it. I've tried the trick where I send it back to someone's head but it just makes a copy. It's so aggravating. @JordanNicoleJJ What a great update! I love the look on Violet's face when she's there to try on dresses. I meant to say this before but I keep forgetting. I like that you aged Derek by taking some of his hair. I admit I could never do that. I loved their wedding and the venue. 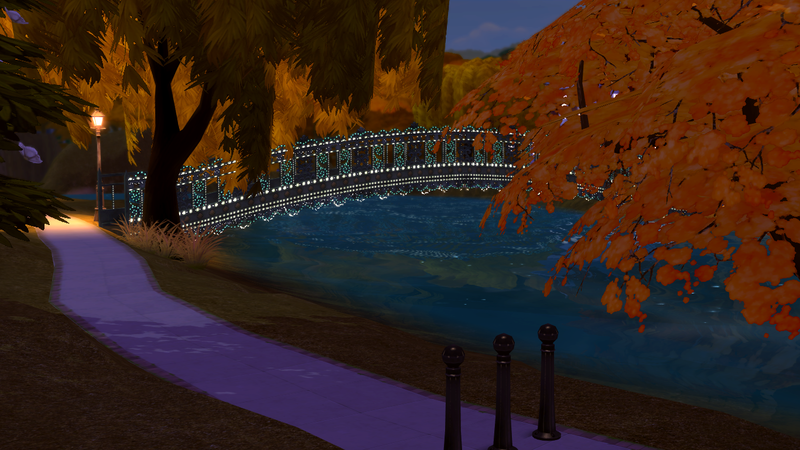 I love that bridge! I've never seen it before!! I can't wait for Owen and Rose!!! Finally a chance to update. I will have to comment at a later date because who knows when I will have this much time to play to myself. "Le sigh"
Daniel is a good dad. He chases the monsters away. He talks to the children when they are bad. 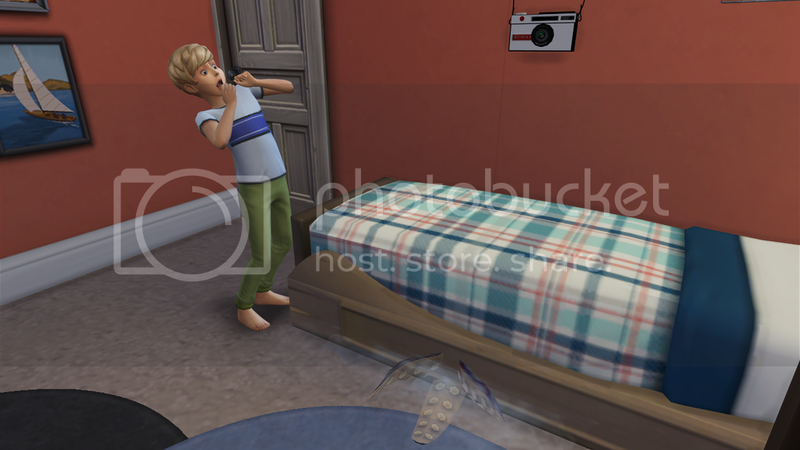 Like when you tease your brother about being scared of monsters under the bed. He just makes it better. Paige is a good mom too. 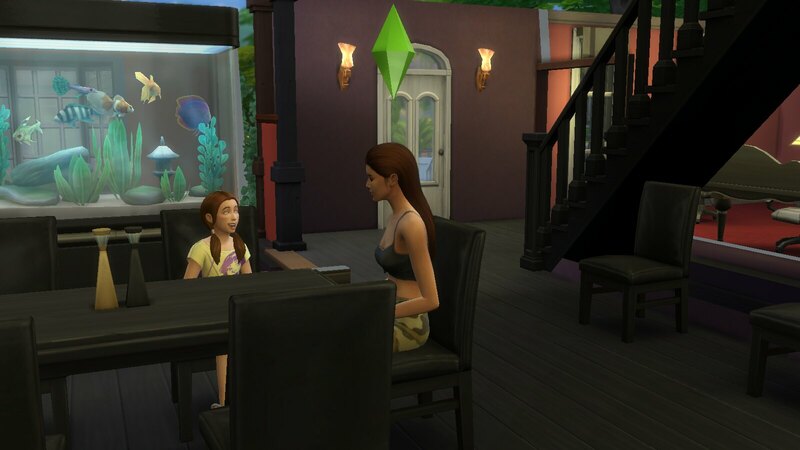 She is always talking to the children and listening to her dad Ezra while he tells his grandchildren stories. She is also a pro at getting rid of the monsters under the bed. One thing they don't have to talk to the children about is the importance of doing their school work. A little alone time finally. After a little adult fun it was time to celebrate Daniel's birthday. Paige was really tired so she left the festivities early. 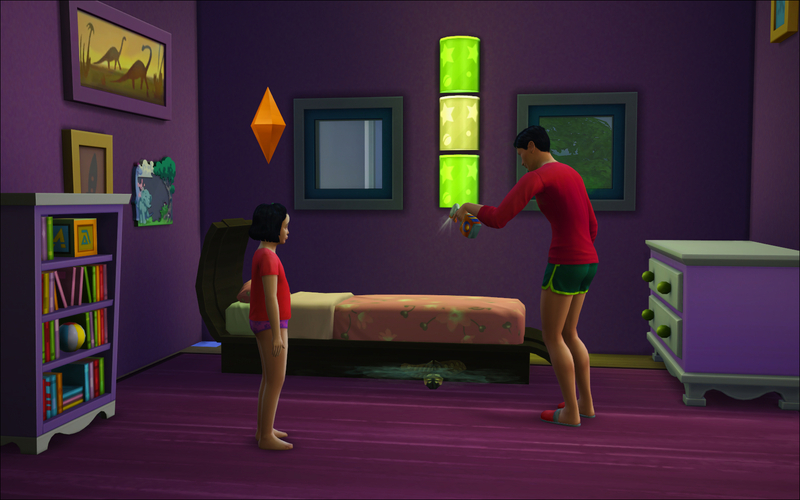 When Paige woke up she found a wishing well in the yard. She wished for some extra money so that she and Daniel could get married. 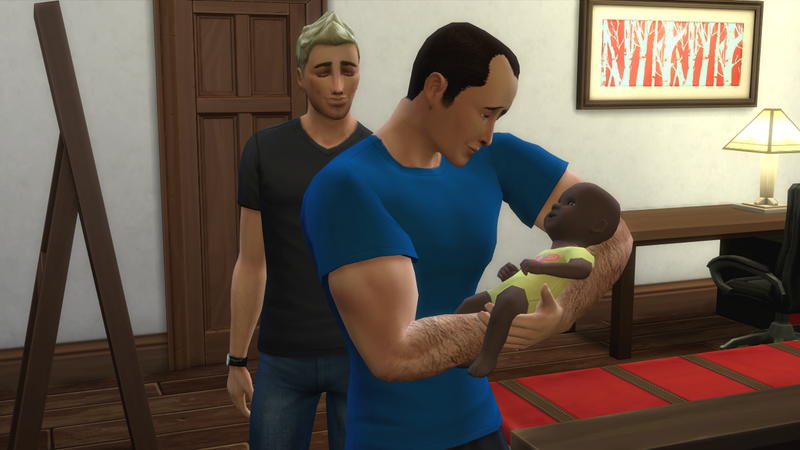 @Amadazulsim - Daniel and Paige's little family is too cute together! You families always seem to bond so well with one another. @Francisca464 - AHHHH that wedding was so well done. Hymn looked great in her gown. Such a great looking venue as well, I love it. @JordanNicoleJJ - Another lovely wedding, and a great venue for the reception. Little Yarar looks so stinking cute! I just love her eyes so much they are so vibrant. @Letchy15 - I really think Xara is my favorite and it stinks that she isn't having any luck in the love department. Update and then back for comments. 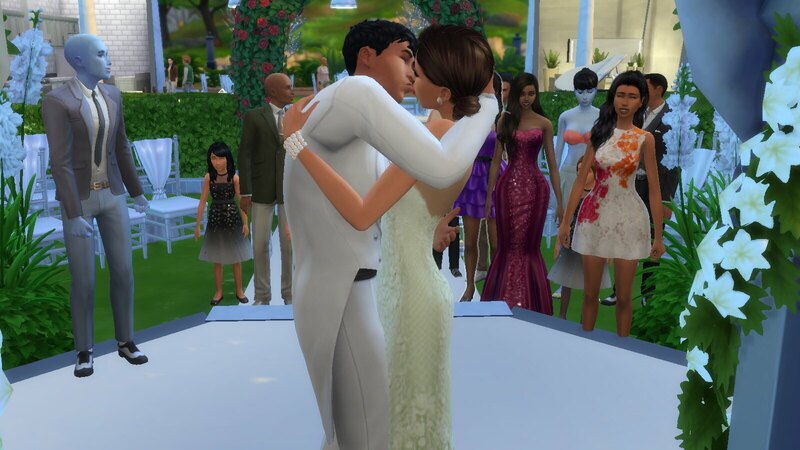 Finally Paige and Daniel were able to get married. I am kinda sad that they couldn't get married before Ezra and Ona died. It was still a happy event none the less. I think Shane looks nice with his new hair. 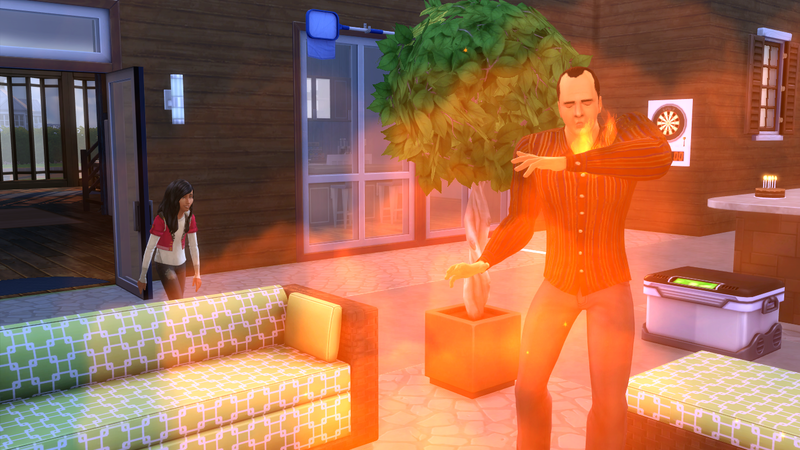 I am glad that Hanzo was okay and that Shane came home in enough time to put out the fire. Shane is looking hot!! All that working out is doing him good. 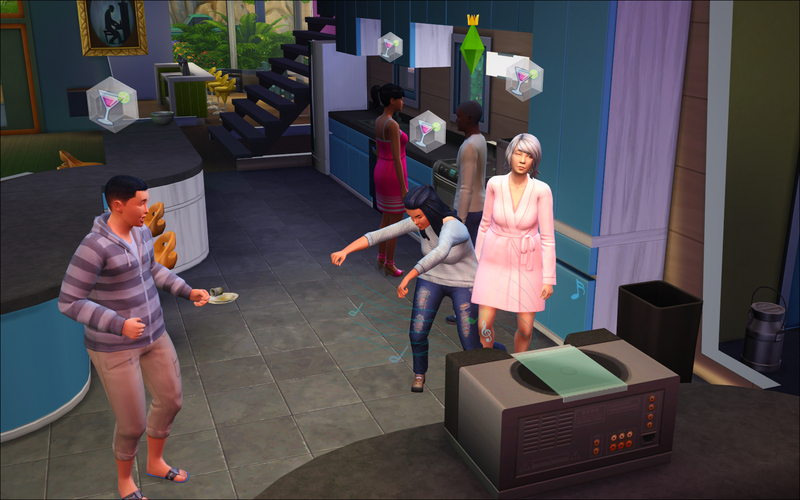 I love when my sims love to dance. They don't dance much this generation. I have also been getting double skulls in the challenge. My family has only collected 4 so far. I am glad that Genji won't let his brother slip into teen ways before his time. Oh and I love the creative names. They are really cool! 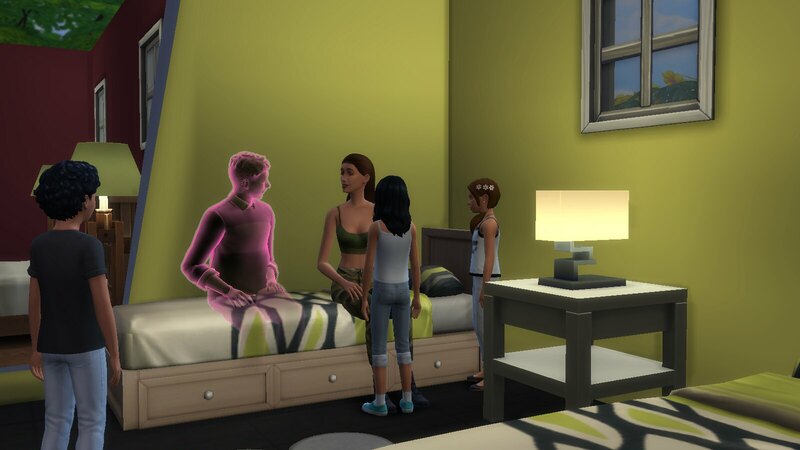 I dislike it so much when a sim you have really grown attached to gets close to dying. It is so sad. 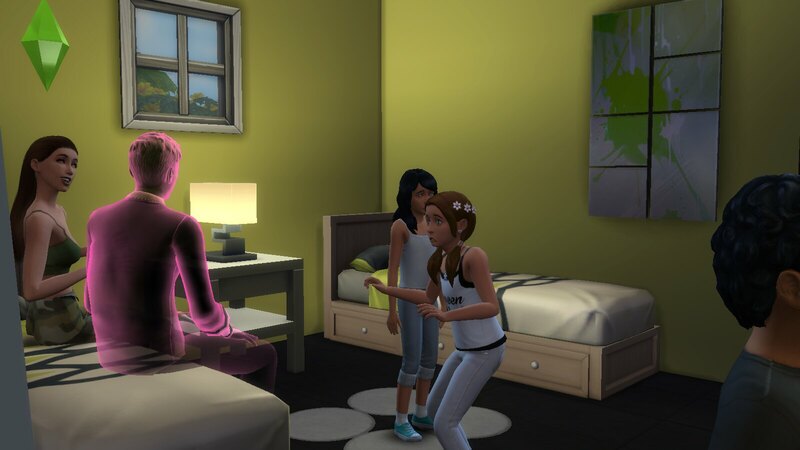 It seems like as soon as I move my generation heir out withing 3 sims days their parents die. Daniel is really a hunk and I am glad that their date went great. Charlotte is so pretty to me, if I haven't already said that. 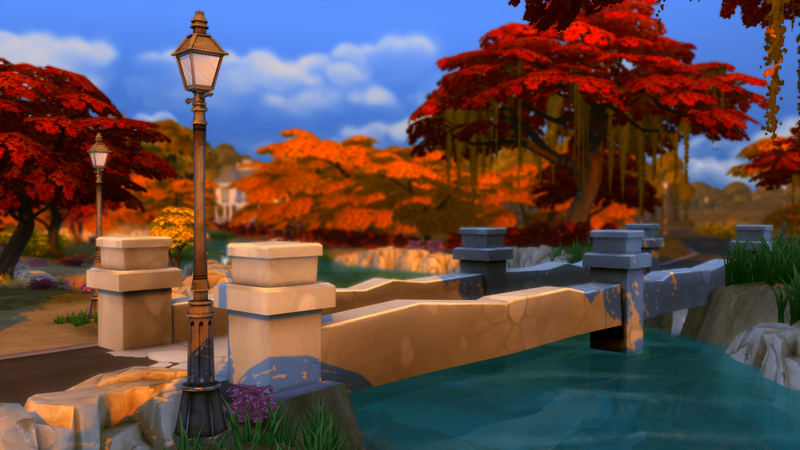 @JordanNicoleJJ - I love the fall colors in your game!! Fall is my favorite season! I have to agree that EA did a good job with this challenge. Noah is doing well in the handiness career. Your boys are really goal oriented. Especially Owen. I love your Halloween party. It looks like everyone had a good time. Beautiful wedding. I agree with you about the bridge. It would be the perfect place for proposals. 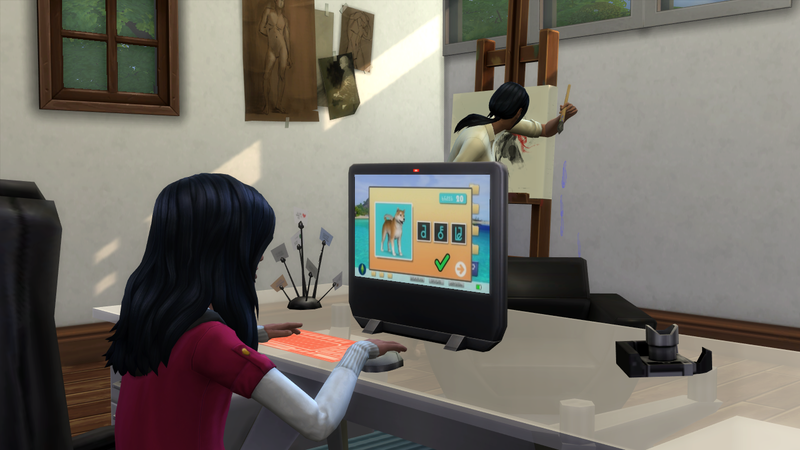 Violet seems to be enjoying her career in painting. Little Yara is a cutie. @debjameswhite - Logan is such a tropper. Even though he is tired he still finds time for his family. Welcome Joshua and Caeden, I can't wait to see them age up. Oh my will there be a new little one joining the twins already. @Letchy15 - Xara's pick up line made me lol! @Francisca464 - Awwww Wei and Hymn are so cute. 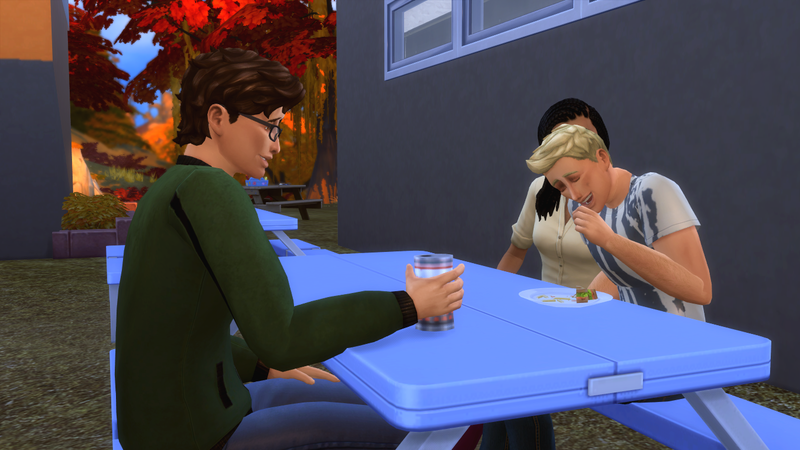 Their little family dinner looked so peaceful. I was waiting to see Wei freak out. Oh how I miss playing him. Elara is so cute. 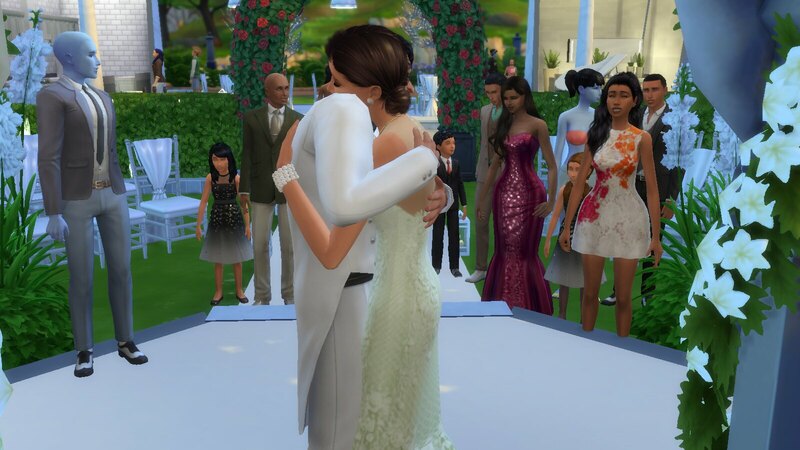 The wedding pictures were beautiful. I love Hymn's dress she looked stunning. @amadazulsim Paige and Daniel's kids are adorable! Raiden's my favorite so far. 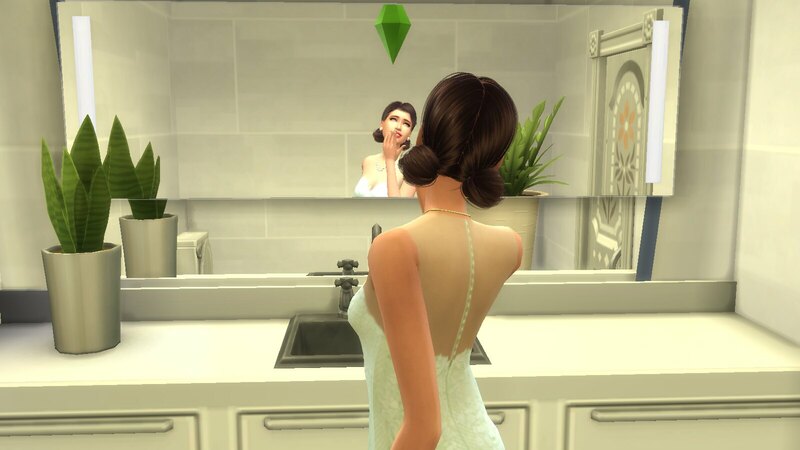 Paige was GORGEOUS at her wedding! Congrats to the happy couple! Noah & Owen are very goal-oriented, Owen's already completed his aspiration and reached level 5 in his career! @OJenn Thanks! Yara's eyes aren't as vibrant now that I switched to Lumialover's defaults, but they're still pretty green! Derek's got a hot date! Remember when the boys ordered pizza the other night? 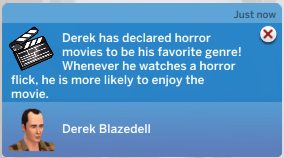 Well, Derek thought the pizza delivery gal was pretty cute! They shared the tiramisu. "A man who orders desert is my kind of man!" They talked the night away--before they knew it, it was 2AM! They had a great time and promised to do it again sometime. I'm glad he's finally getting back out there--and enjoying it! They've even got their own secret handshake. Noah better keep an eye on them...I couls see them being partners in crime when they get older, lol. 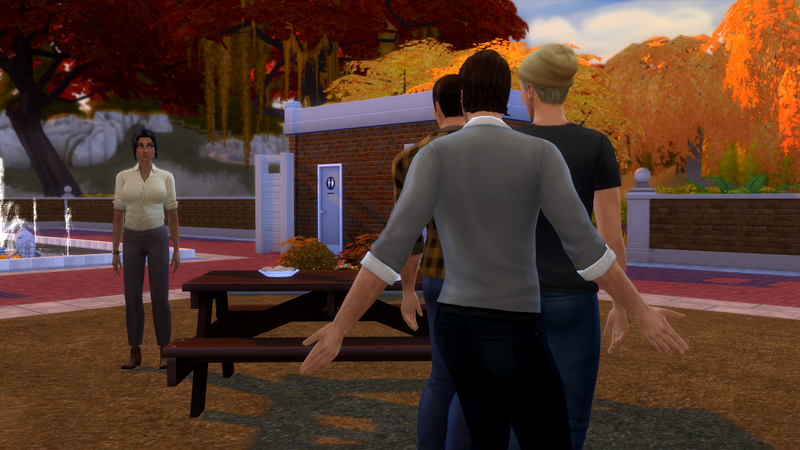 Derek decided to have a backyard bbq for his elder birthday. Yara's like, "Grandpa, you're supposed to light the fire, not yourself!" lol. 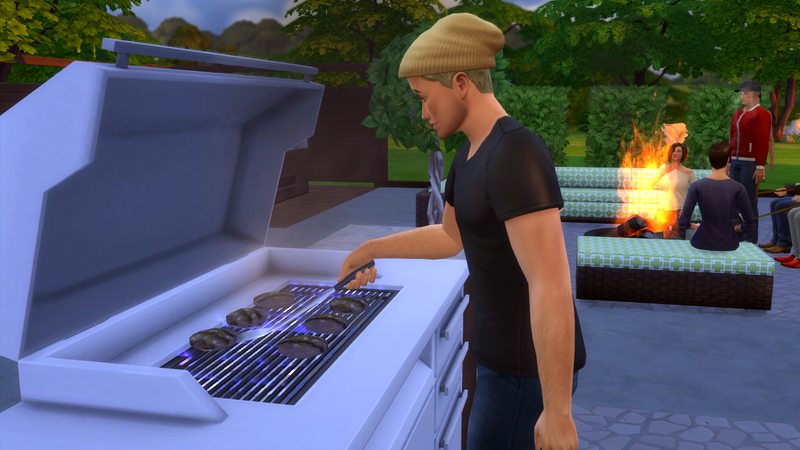 Noah grilled burgers for the hungry guests. Violet's been putting on a little extra pudge lately, and it's not from the burgers... If you guessed she's pregnant again, you're right! She announced it at the party--Yara's excited to have a little brother or sister! Yara was tuckered out from school and passed out early, which gave Derek and Ellie some privacy for a little fireside cuddling. The next morning, Yara and her favorite Uncle Owen had cake for breakfast. "Don't tell your parents, kid." She spent the rest of her Saturday playing Keyboard Commander and watching her mom paint. 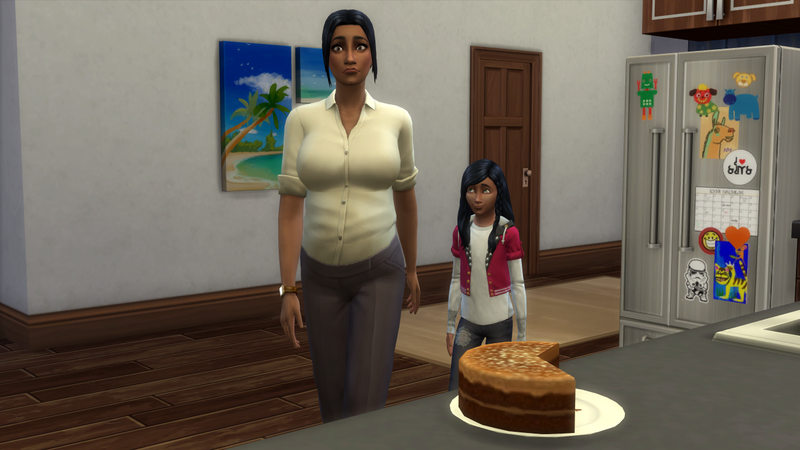 Vi and Yara went to have a mid-afternoon cake snack when Vi went into labor. It's a boy! The randomizer named him Xavier. 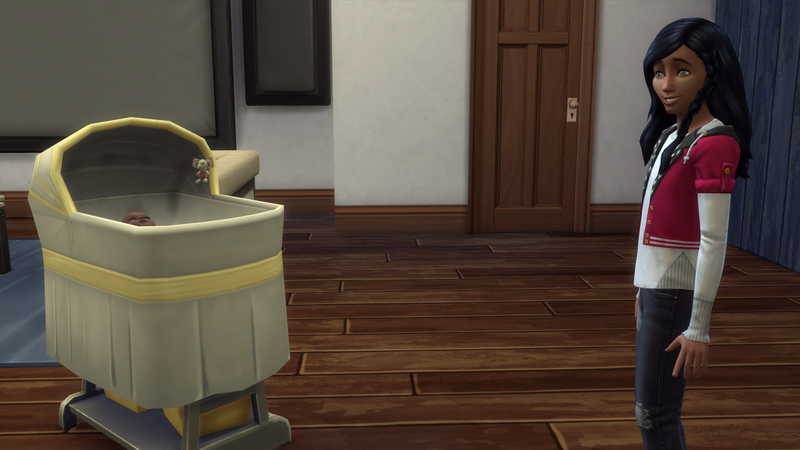 Yara loves her little brother already and can't wait for him to be big enough to play! 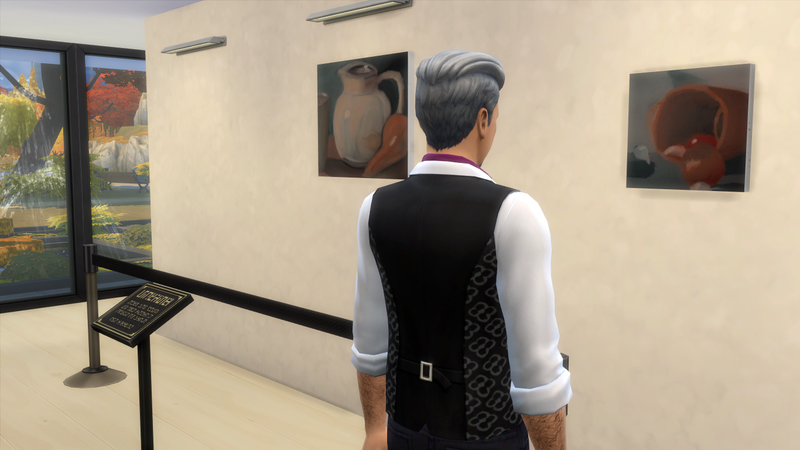 I already aged him up--he's an Art Lover who wants to be a Whiz Kid...interesting combo, lol. 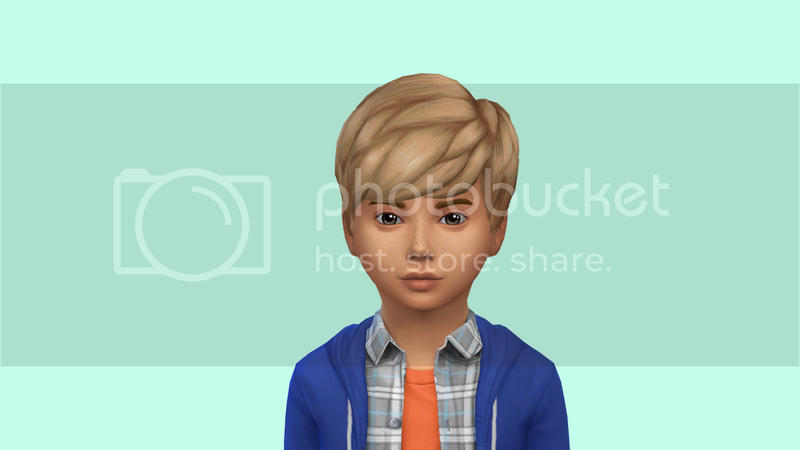 He's got his mom's skin tone, eye color, and lips, with his father's hair color, eye shape, and nose. He's a pretty cute kid, if I say so myself! I peeked at his and Yara's YA genetics...they're okay, but I think I'm going to pursue Owen & Rose. Thought I would take a post to update you all on how my founders have been doing. At this point in my game play they have been long passed, but I haven't posted that far yet so wanted to update now. This post will be picture heavy! 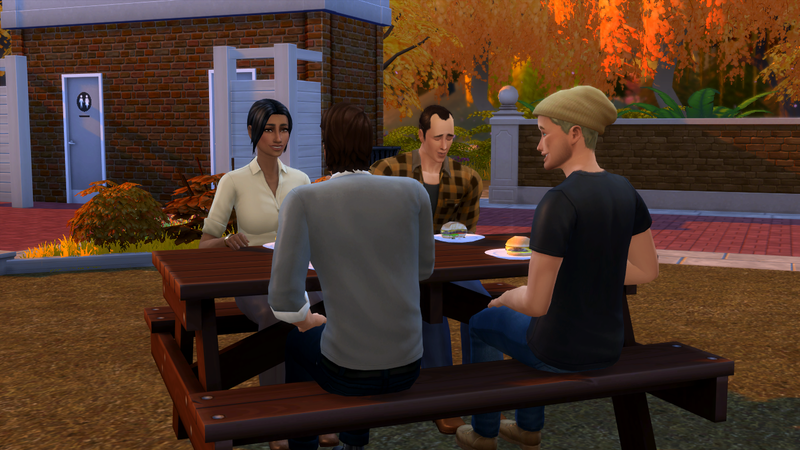 As you may remember, Ramin & Amaya Alley had moved into a retirement home with my other rotation founders. However, after a time, they decided they were not happy and wanted to move “home”. 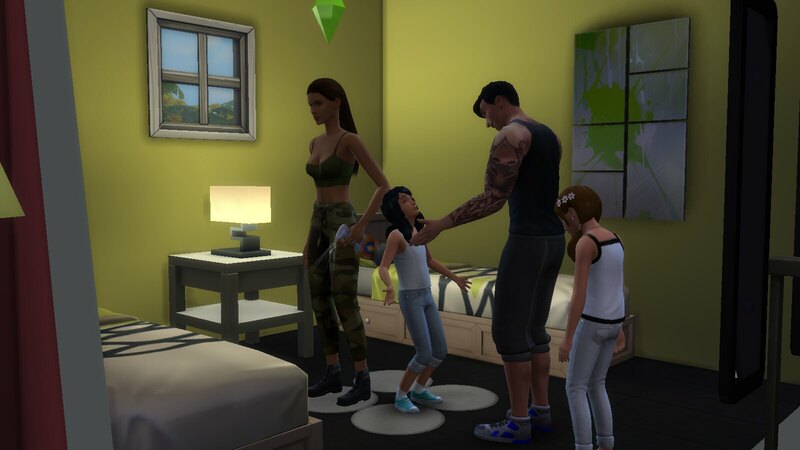 Their daughter, Gabriella, and her family were living there now, and happily welcomed them back into the house and gave them their old bedroom back. 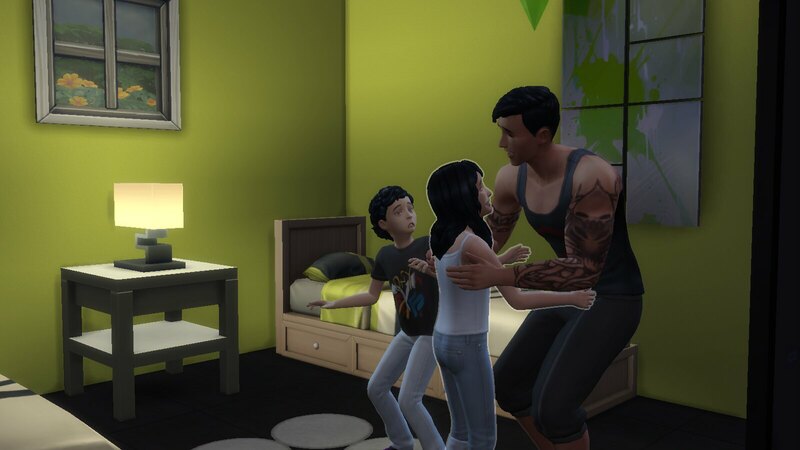 Ramin & Amaya were so much happier living back in their first home. 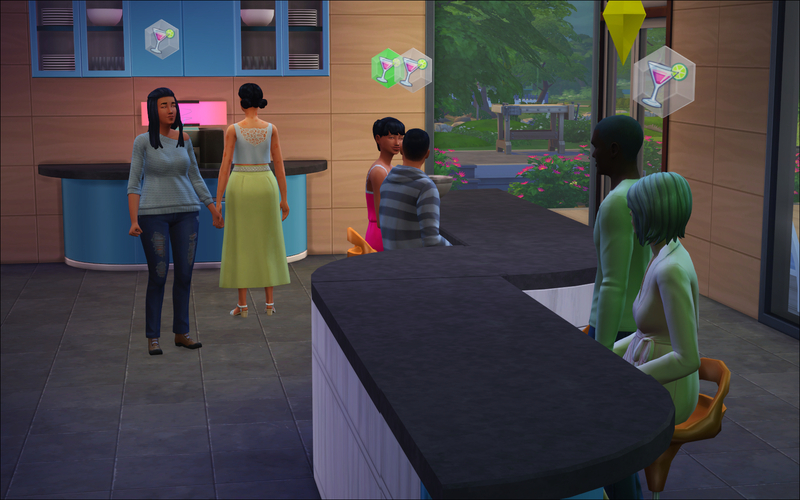 They got to see their family more often, even though their children did visit them at the retirement home. It just wasn’t the same there. 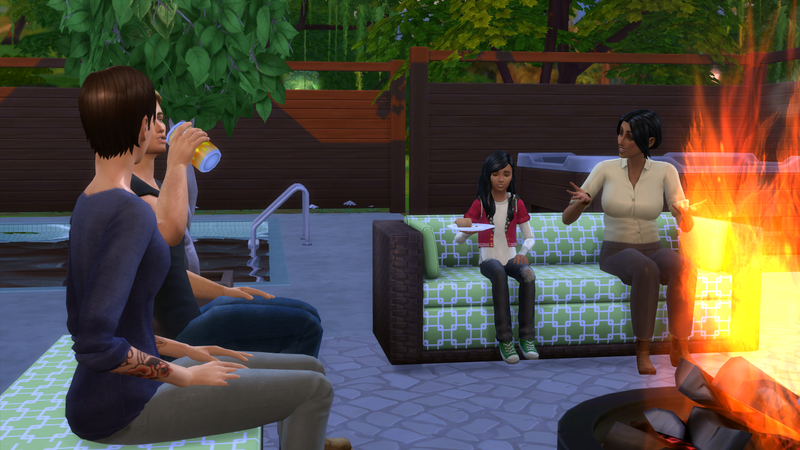 The whole family decided to create a club so they could spend even more time together. They spent a lot of time cooking, eating, dancing and just hanging out chatting. 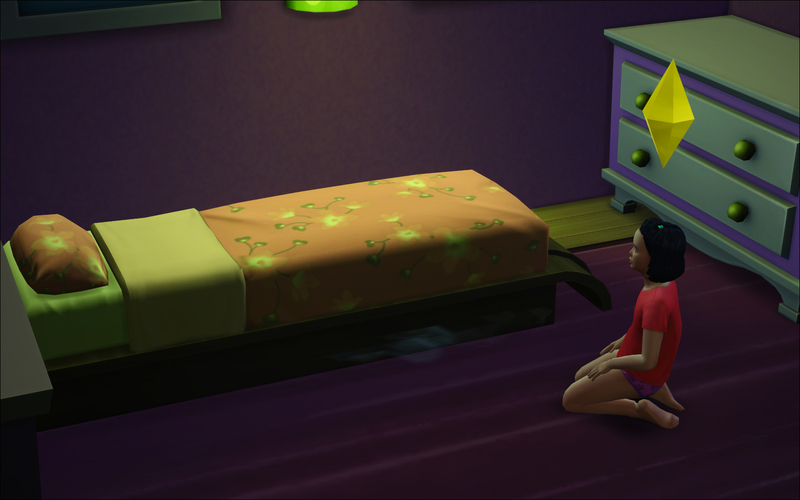 Gabriella & Kyle’s first child, Brianne, began having nightmares and claiming there was a monster under her bed when she was trying to sleep. 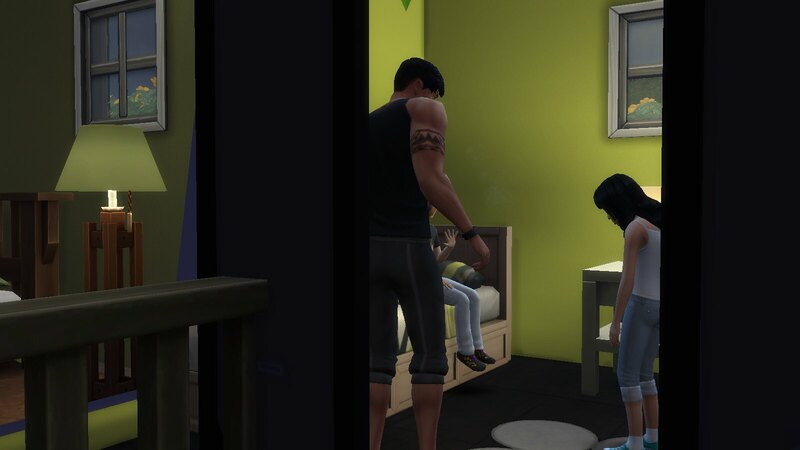 When her parents began to get frustrated with this happening night after night, Brianne decided to try and talk to the monster. 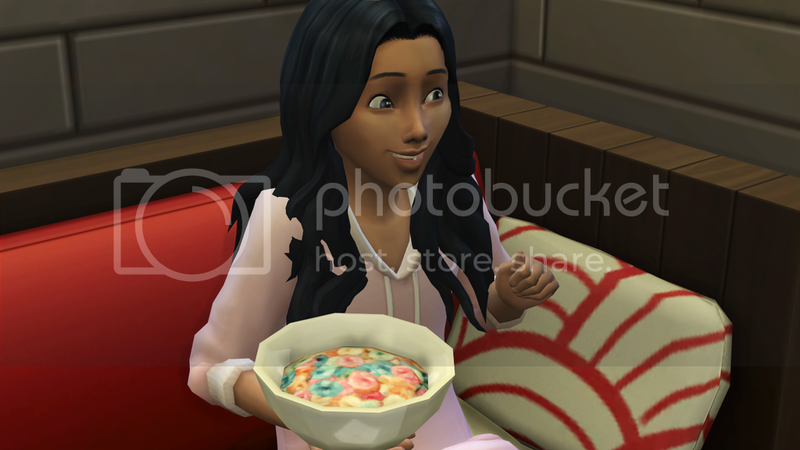 She wasn’t very successful…even though she tried to offer it a bowl of cereal. Ramin & Amaya were still very much in love, and didn’t slow down their intimate life at all, even though it nearly killed them every time. 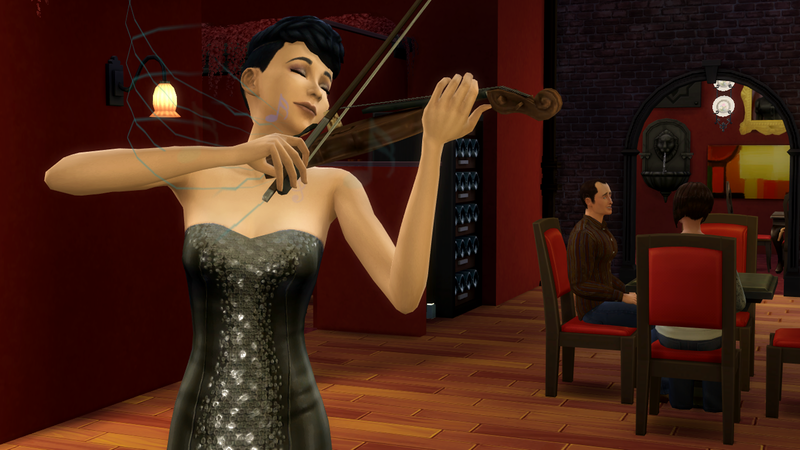 Ramin knew his days were short, so he made the best of those last few years. He spent lots of time with Amaya and enjoyed fishing in his spare time, when he wasn’t mixing drinks or gardening. One afternoon, Ramin complained that he wasn’t feeling very well and wanted to go lay on the couch and watch some TV. 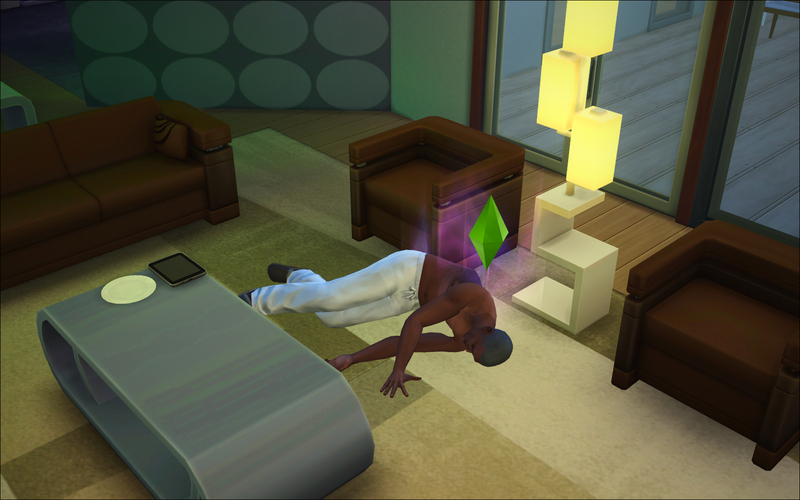 Before he even made it to the couch, he fell to the ground, his spirit leaving him. Grimm showed up of course, to transport him to the afterlife. 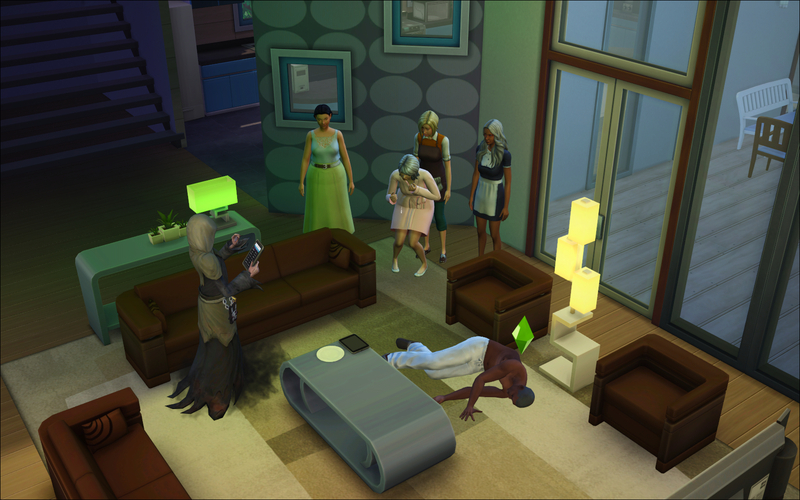 Everyone in the household, including the gardener and maid, were so sad to see his long life come to an end. 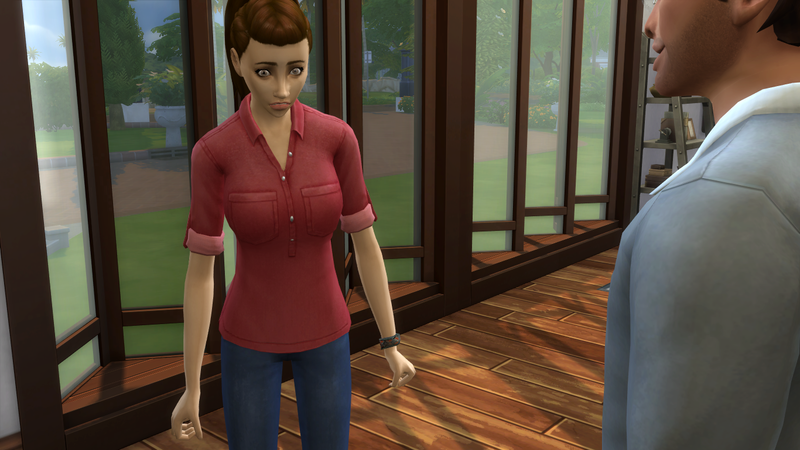 Gabriella was so distraught that she started saying nasty things to the Grimm. Amaya took her in the other room and tried to calm her. She also warned her that she felt her time was short, too. Within days, Amaya joined her husband in death. 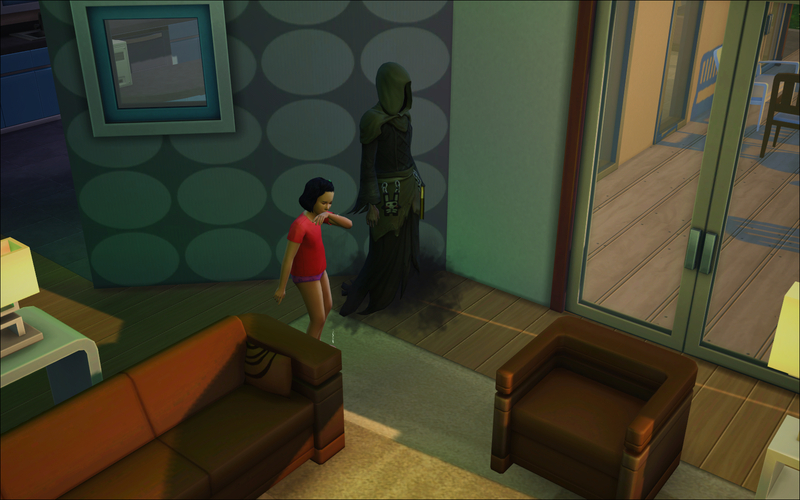 Only Brianne was home to witness the death. The Grimm stood solemnly by as Brianne sobbed and sobbed. Gabriella wanted to bury her parents on their land, near Ramin’s gardens, so they could rest where they were happiest. Brianne visited them often, as did the rest of the family. It was time to live on and continue the legacy they had begun. @JordanNicoleJJ Richard's red hair ends up being a VERY strong gene in my family too!! But you'll see that soon... Also, I added in the fall mod as well. I love how it makes the game look! 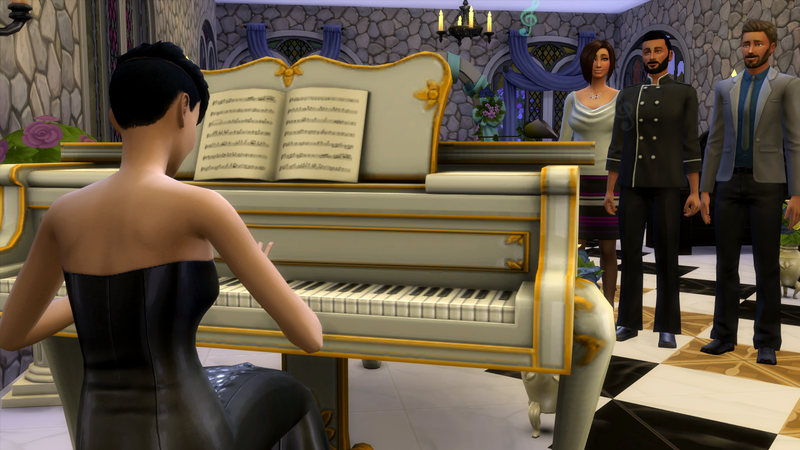 Your sims are so freaking gorgeous! 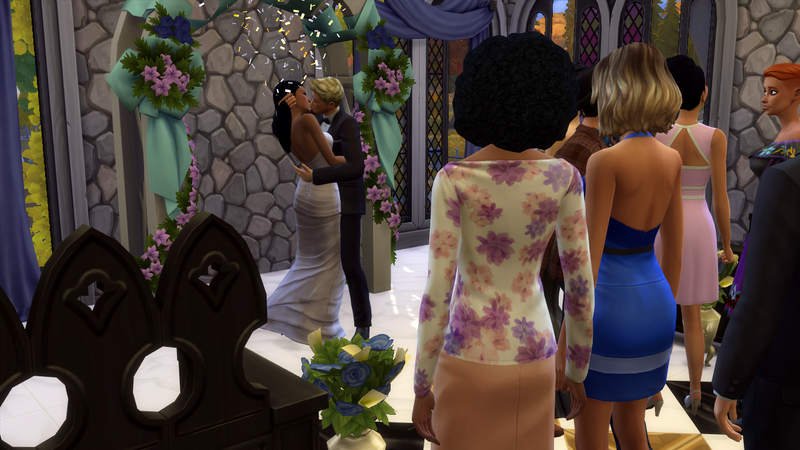 I love the wedding setting! @OJenn Glad you're ok!! Has Nicole affected you at all? Charlotte is gorgeous. I think I say that about all your sims. They're so stunning! @soulfull Thanks for the comments on my last post! I love how the game imitates RL too! 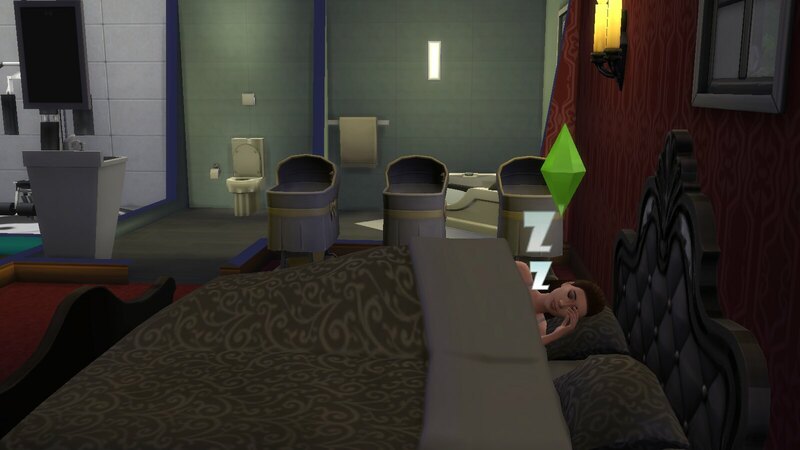 Sometimes my sims do things I've not noticed before and they're so realistic, it catches me off guard! @debjameswhite Kenzie is so pretty in your game! I laughed at her being embarrassed at the hospital for her husband's actions lol. She certainly didn't seem to mind trying for another nooboo immediately after having the first! @Heckstress17 Thanks for all the thoughts on the game! And for the skin link too! I can totally see what you're talking about. I try to be open about new expansions, as they seem to want to do NEW things for the game instead of just repeating what they've always done. But there are things I would really really love to have in game too, like toddlers, more realistic age things, pets...etc. 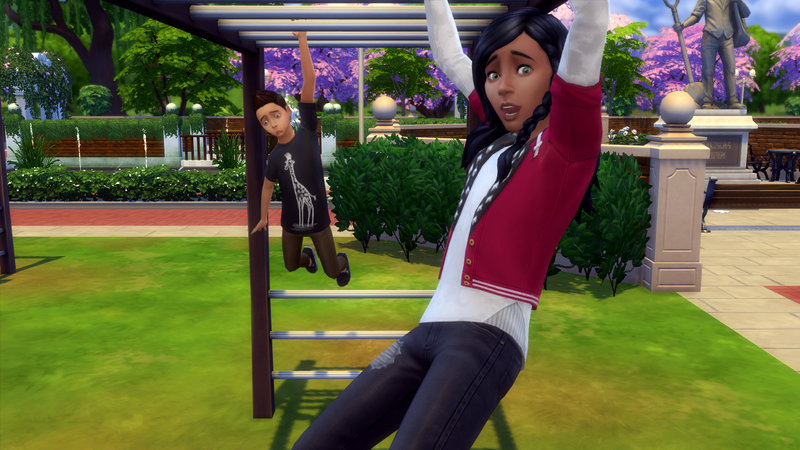 I finally got to download the kids stuff pack last night! So I'm excited to see what that brings into my game. @Letchy15 I love the screenshots you get! They're so fun! @Francisca464 I really do love Wei in your game. He looks so funny when he gets sick, too...the blue skin, tats and the red swirls! 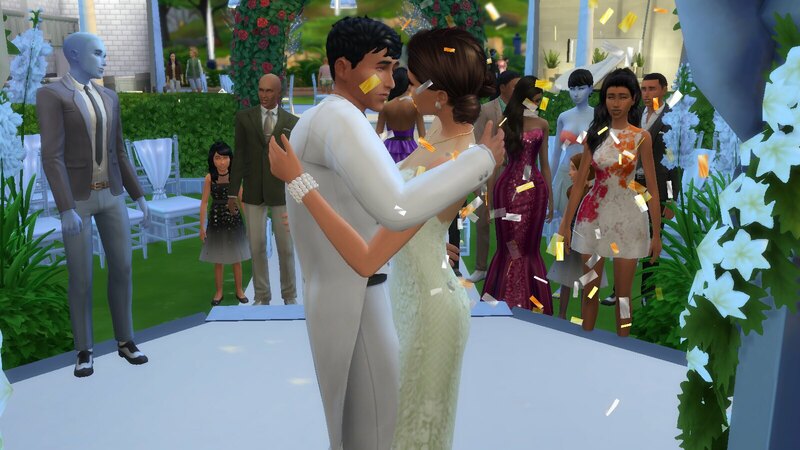 He and Hymn's wedding was beautiful! @amadazulsim I feel your busy-ness!! I've been the same way! 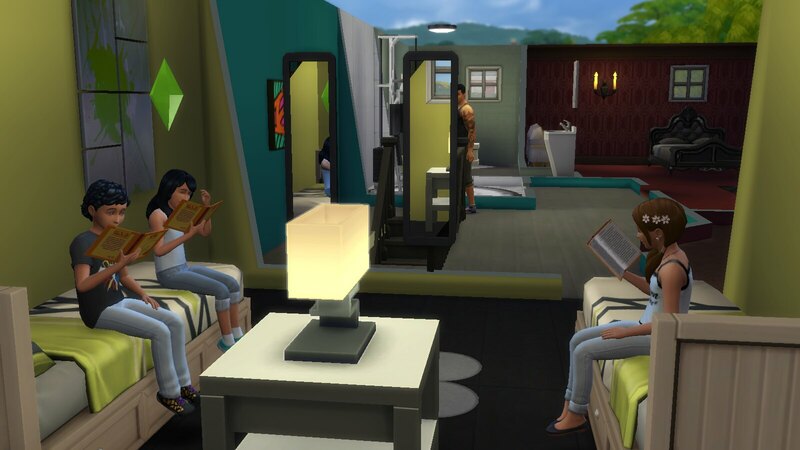 Glad to see any update from you though Love the pics of Paige in the mirror! Does she just not care that the sink is spouting water?